Various visits by him to the exotic Caribbean, resulted in a first page. But this page has propliners closer to home - but not in all instants as easy to get to. Dirk added: "I have been travelling the Arctic for almost 20 years for at least one trip, sometimes two, a year. Always pick a different final destination, but always travelling through the hubs of Yellowknife and/or Rankin Inlet/Iqaluit. I do it the hard/cheap way: two days on the bus Campbell River-Hay River and again two days back from there. On the 2009 trip, for example, I camped out 10 nights in 7 different locations. Tiresome, but the bottom line is that it's cheap. Over the years, I've developed a network of friends and contacts where I can get free coffee in the morning, a shower when needed or a couch when weathered/snowed out." 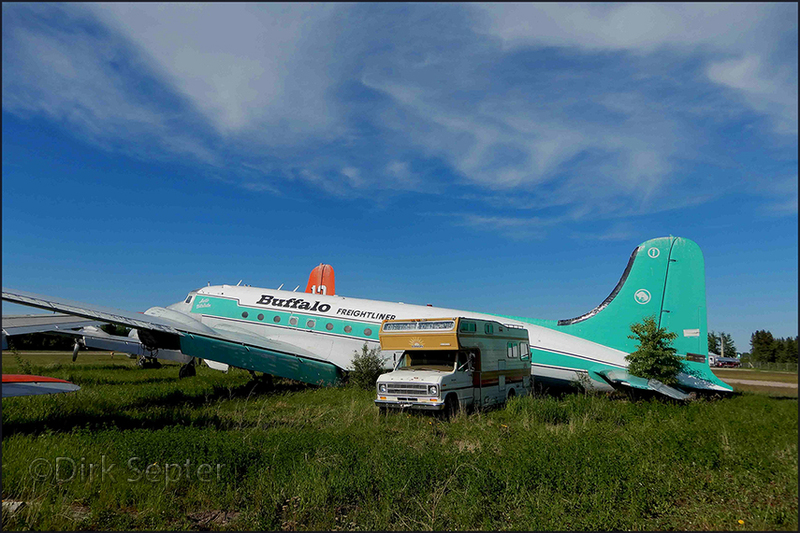 Dirk wrote: "In the junk yard that used to belong to Cliff Everts sits a wing with an CF- registration." Maybe the wing(s) of CF-FNC needed replacement after purchase, 1986-'90. 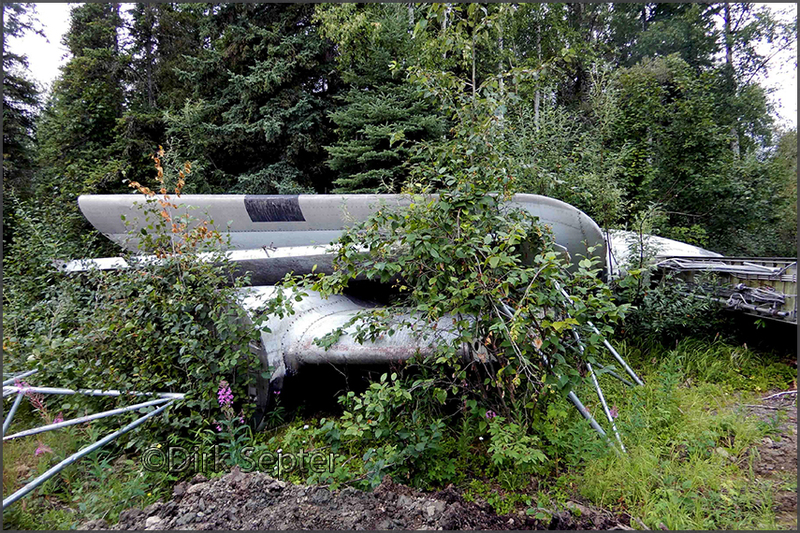 In my own records I found that on 09Jul2002 N1837M landed at Iliamna,AK with its lh-engine on fire (no injuries). Maybe this caused a wing replacement and over the years the original CF-FNC number became visible again. Less likely. The insert was taken while the aircraft was still in the hangar. Dirk's earlier photo of N683DH is a little bit further down this page. up on... See the gallery of Ron Mak on my website for the details, there is little or nothing on it online! 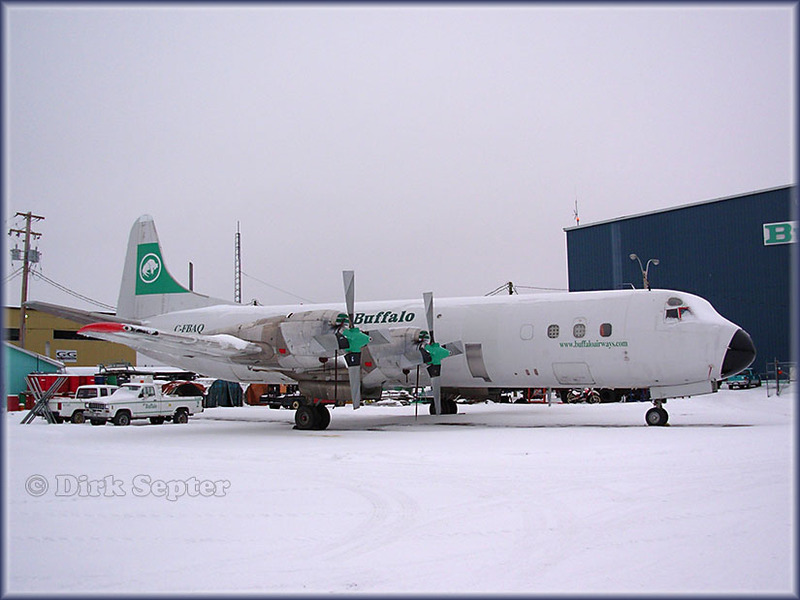 Douglas C-54 C-GPSH (c/n 7458) 'Buffalo Freightliner', named 'Arctic Distributor'. 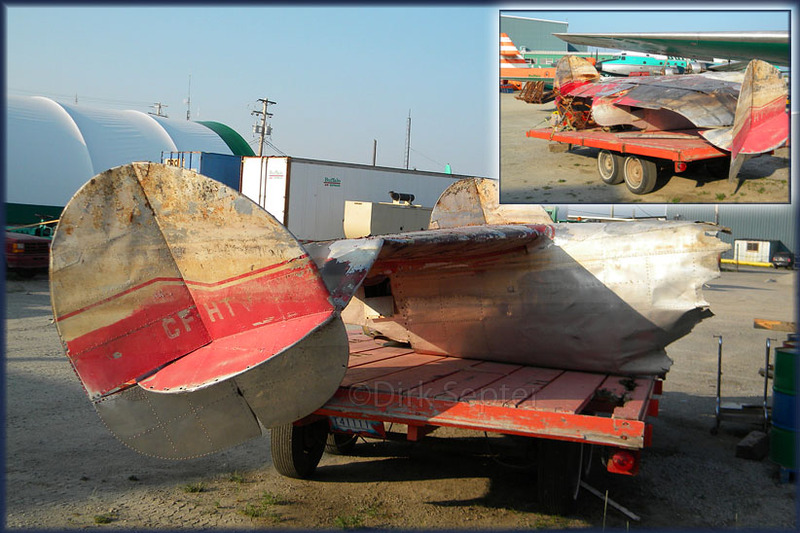 Damaged at Carat Lake 28Dec06: slipped off the	runway... Brought home but it looks really sad. 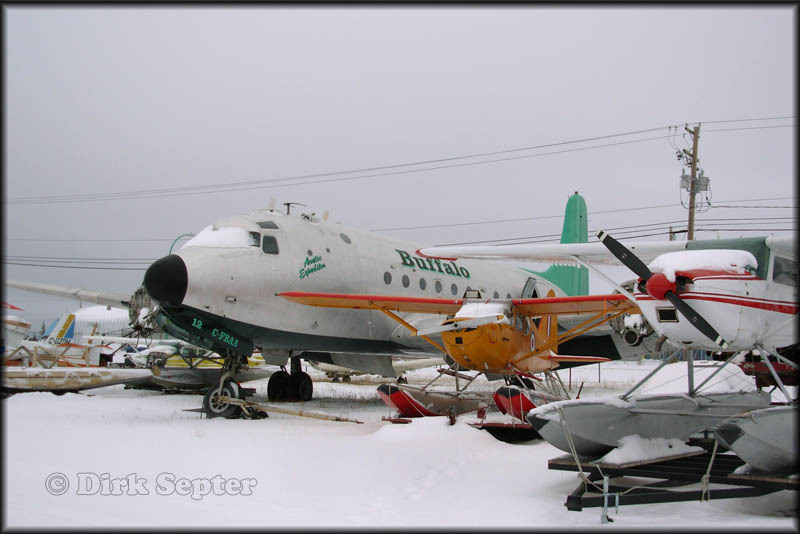 See my 2006 Yellowknife visit, which shows C-GPSH in better days plus the situation at Carat Lake. Damaged in landing incident at Y'knife 05Mar12, rh main landinggear did not go down, but repaired and returned to service. Here a few pics taken at YBL Campbell River airport on 19Jul2017. 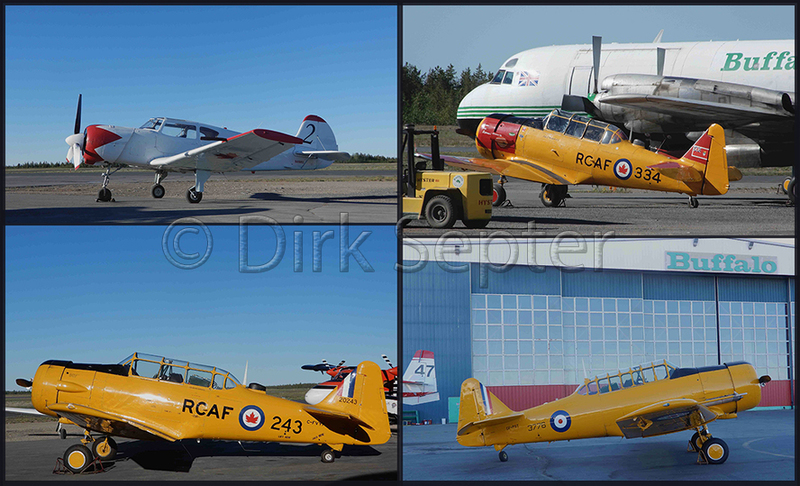 "A regular summer visitor Grumman G-21A Goose N39FG built 1939 (cn 1059). 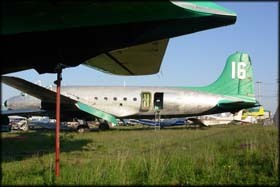 I never realized this is actually Trans Provincial Airlines former C-FBXR. 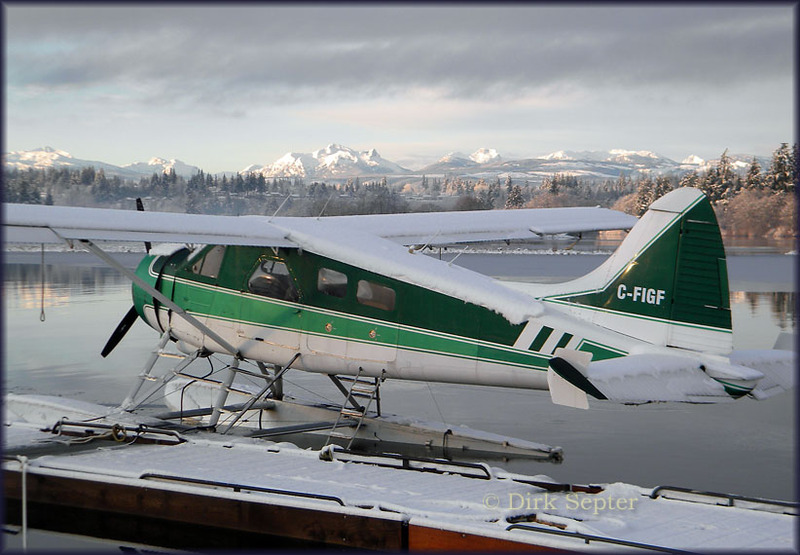 In the late 1980s-early 1990s I often flew on this and the other three TPA Goose aircraft between Prince Rupert and the Queen Charlotte islands (now called Haida Gwaii)." -Dirk Septer. Fred Barnes sent me a nice 2011 action photo of N39FG, see Photos by Friends & Guests (30). Reg'd 25Apr2011 to DIESEL ACQUISITIONS LLC. 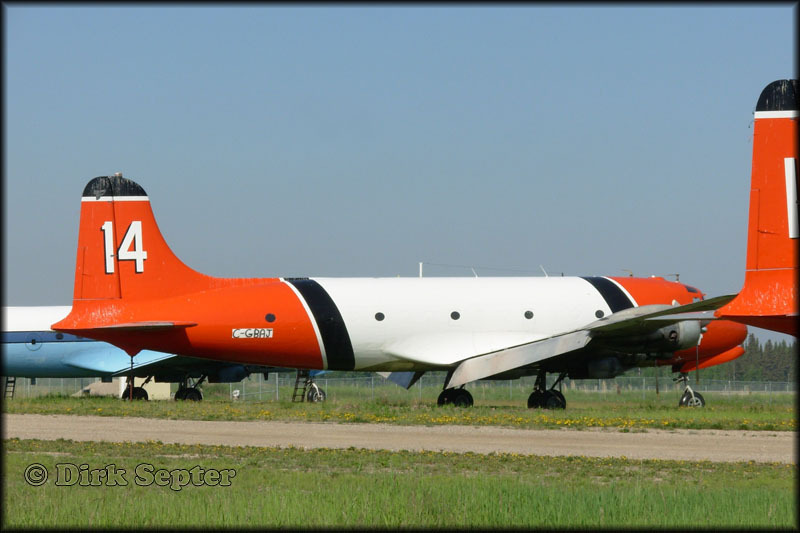 Tanker 490, C-GZCF (c/n 1091) - built 1959. "Here are some photographs taken at the Yellowknife, Northwest Territories airport, on 18June2017. These four aircraft were taking part in the 2017 Canadian Arctic Aviation Tour. The larger team of pilots were performing with their aircraft in 97 (!) air shows during the summer of 2017." It was sold in 2013 to Buffalo Airways and being stored in their Hay River's (NWT) DC-4 grave yard. Built in 1954, serial 44434, line no. 515. Among the many operators we find the Los Angeles Dodgers base ball team, which used this aircraft in 1961 under the N1R registration. Later converted to 'swing tail', no. 2." Will that Swingtail ever swing again...? Dirk Septer sent me this photo, of a 27May2017 visit to Campbell River, B.C. 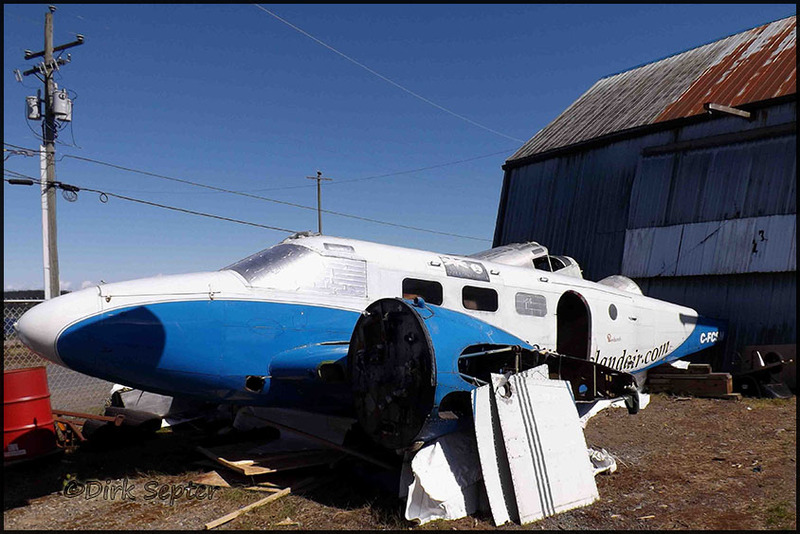 Dirk saw this DeHavilland Dragon Rapide at Campbell River (CYBL), for some fabric work done and then G-AHXW is to head back to the Historic Flight Foundation at Seattle,WA. Might be here for a month or so. The Rapide was a 1930s feeder liner and RAF light transport. This one was made by Brush Coachworks Ltd. in the UK, so likely part of WW-II production for the RAF and it was then civilianized as G-AHXW as still worn here! In late 1933, the Dragon Rapide was designed at the de Havilland company as a faster and more comfortable successor to the DH.84 Dragon. It was in effect a twin-engined, scaled-down version of the four-engined DH.86 Express. It shared many common features with the DH.86 Express, including its tapered wings, streamlined fairings and Gipsy Six engines but it demonstrated none of the operational vices of the Express and went on to become perhaps the most successful British-built short-haul commercial passenger aircraft of the 1930s. 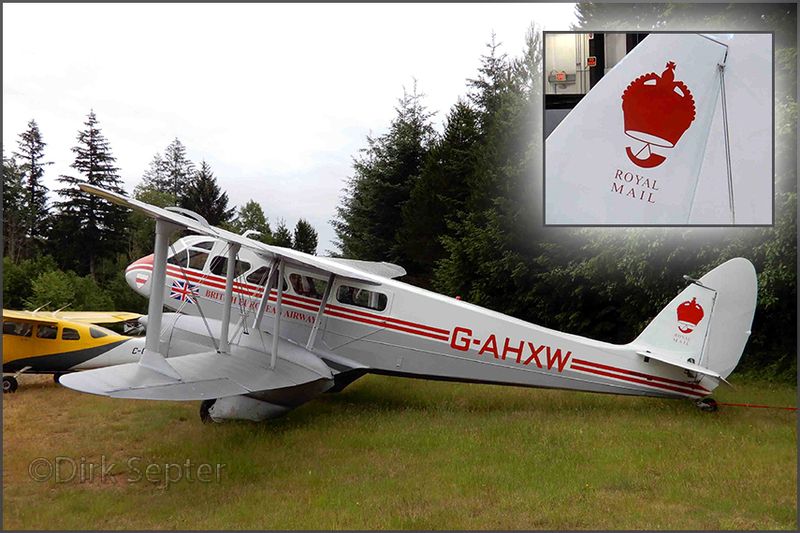 In June 2018 Dirk shared photos with G-AHXW in its Royal Mail livery; see further up this page. Twin Beech C-45 N585PB (BuN.29585) of Historical Flight Foundation (HFF), also at Sealand's @Cambell River. Obviously a long term project, for Dirk has registered it here before (see further down). 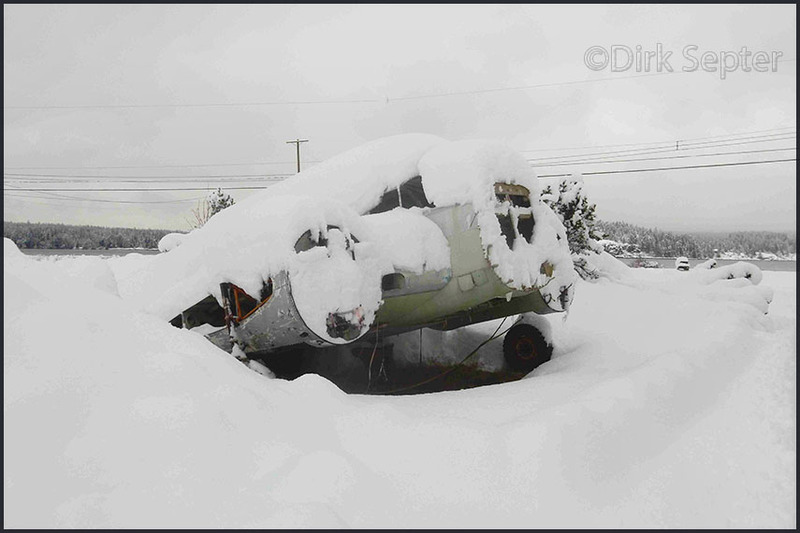 C-GAIV is almost buried in snow here at Campbell River in Feb.2017. That month Campbell River received over one meter of snow in 6 days! Constructed by Beechcraft as a C-45F, it was taken into service with the United States Army Air Force ca. 1944, with serial 44-47087 (c/n 6966?). In 1952 it was remanufactured as a TC-45H, upon which a new construction number was assigned to the airframe: AF-80. From 26 June 1952 to April 1961 it served with the United States Army Air Force with s/n 51-11523. Shortly after which it was rereg'd as N158L for Jerry Leeds (of Evansville,IN), in 1963. 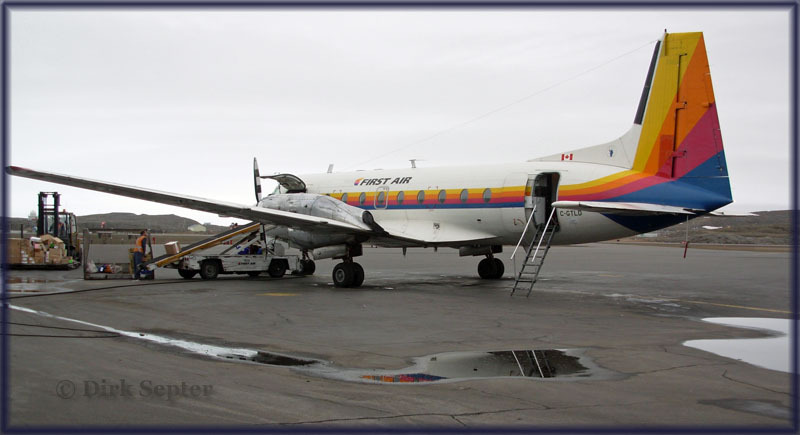 From From May 1963 to 1967 it went to Wardair Canada Ltd (Yellowknife,NWT) as CF-PCL. 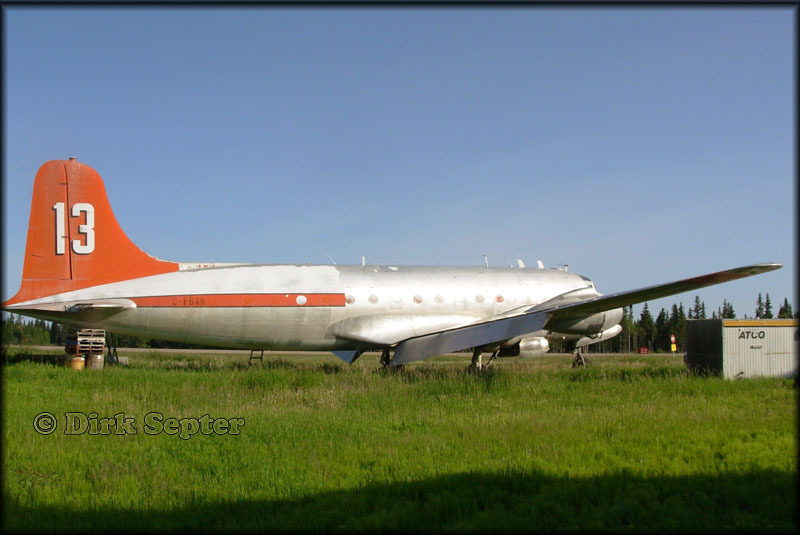 In 1970 it moved to La Ronge Aviation Services (Edmonton,ALB). 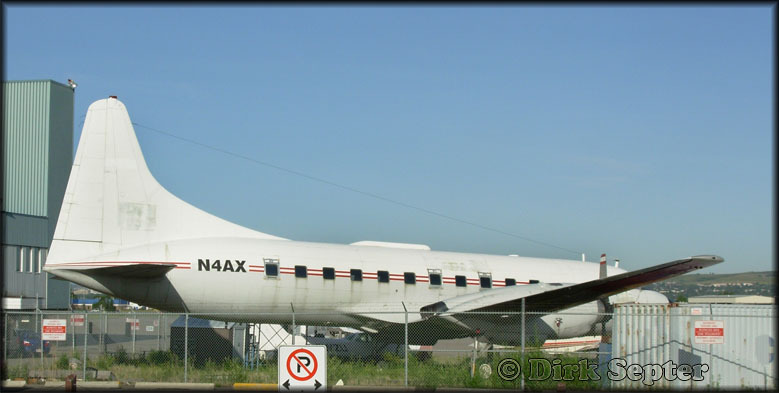 From 1973 to 1976 it operated with Sioux Narrows Airways (Winnipeg,MAN). After which it crossed the border down south again, from September 1976 to 1977 it flew with Cream Puff Productions of Duluth,MN while reregistered as N711KP. In 1978 N711KP went to Kitchi Gammi Air (also of Duluth,MN). Alas, that seemed like the end of the road, as it was withdrawn from use and not until 1992 before it stirred again; it was in no fit state to fly anymore and was transported by road (to where?). But that year, 1992, msn AF-80 was restored as a float plane. 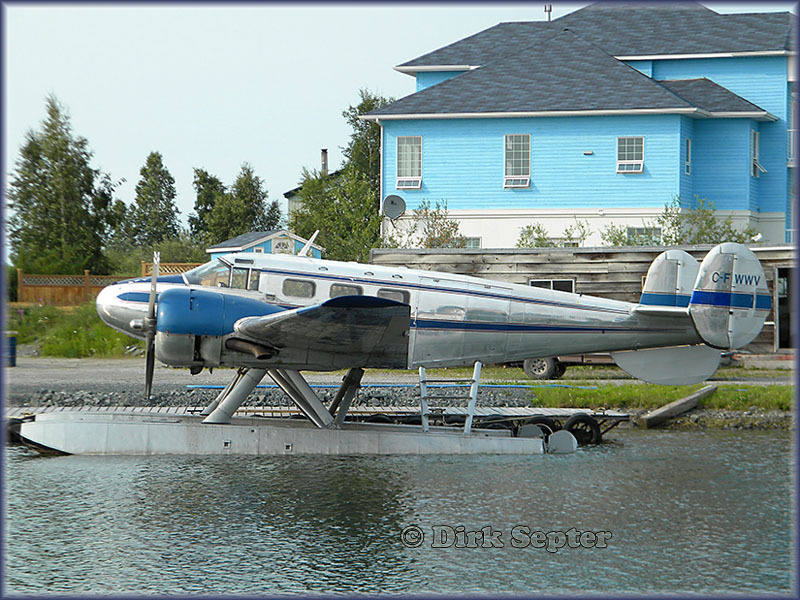 Maybe it went to Rusty Myers near Ft. Frances (Ontario, Canada) as they have a tradition of Beech 18s on floats...? 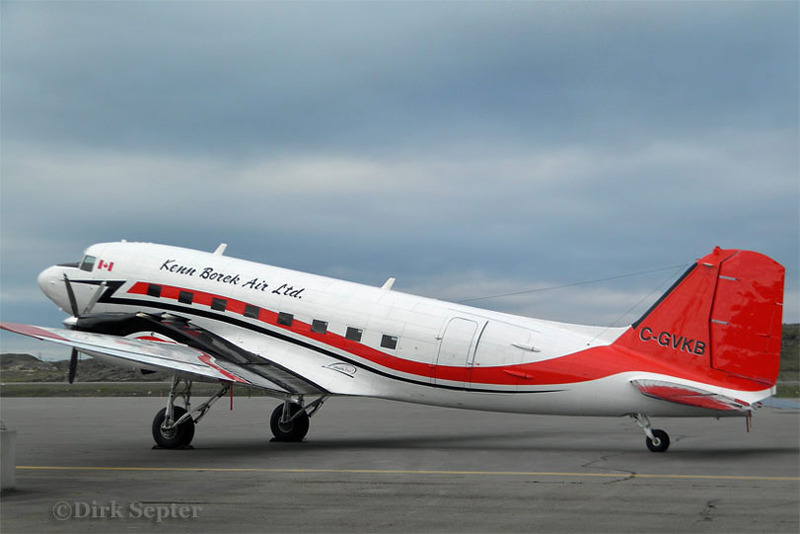 With a fresh start in life, on 10May93 it went, newly reg'd as C-GAIV, to Eagle Aviation Ltd of Pine Falls (Manitoba). 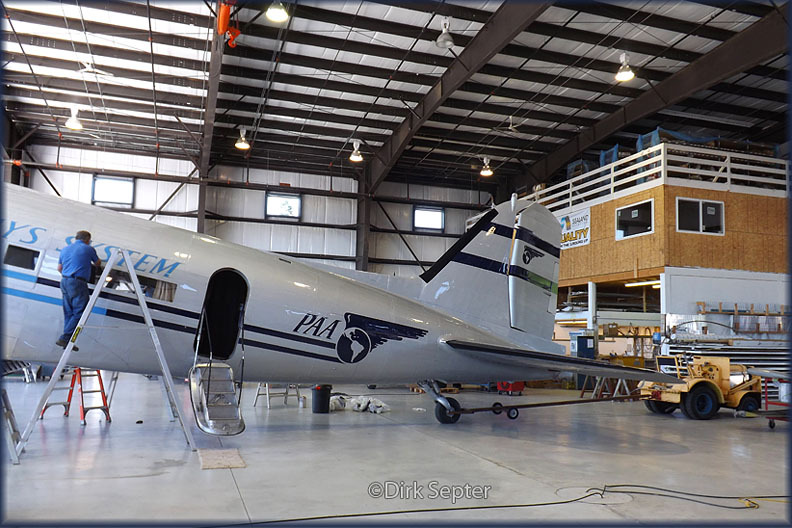 In October 1995 the next owner became Blue Water Aviation Services (Pine Falls,MAN). 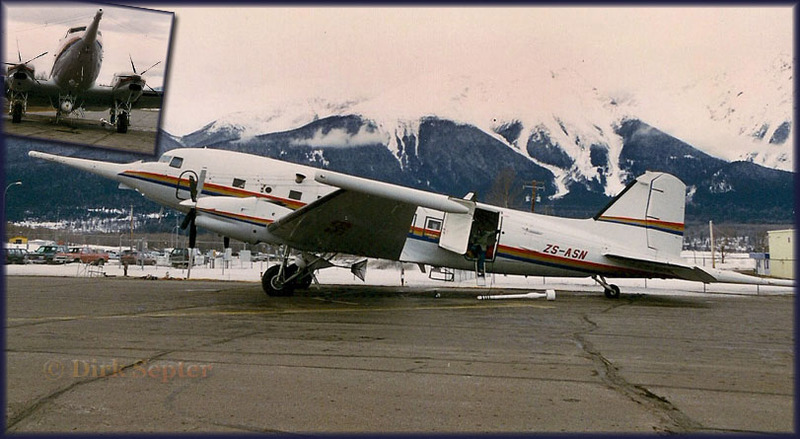 And on 24Oct97 the new owner became Vancouver Island Air Ltd. of Campbell River,BC. 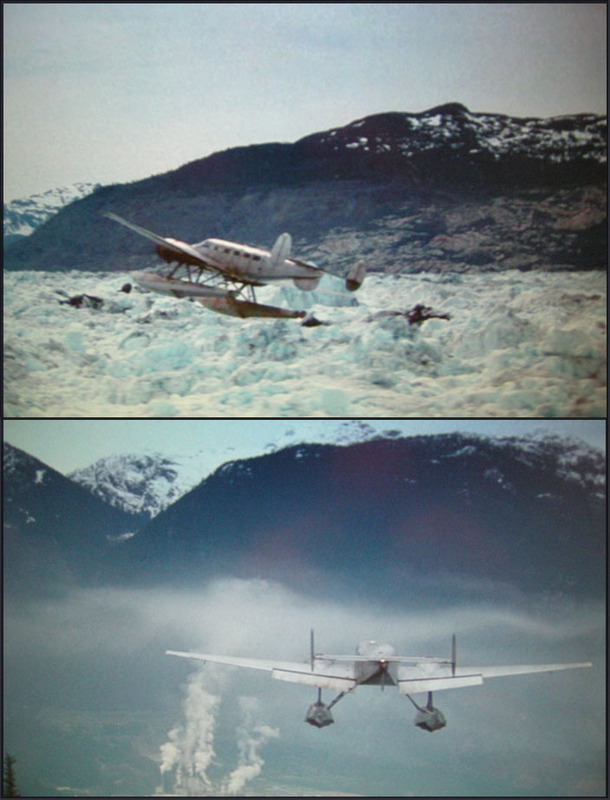 In 2001 C-GAIV flew to Juneau (Alaska) for its final star performance in the movie 'Insomnia'. And in 2002 it was final 'curtains', as it was scrapped and over the years deteriorated to this sad condition. 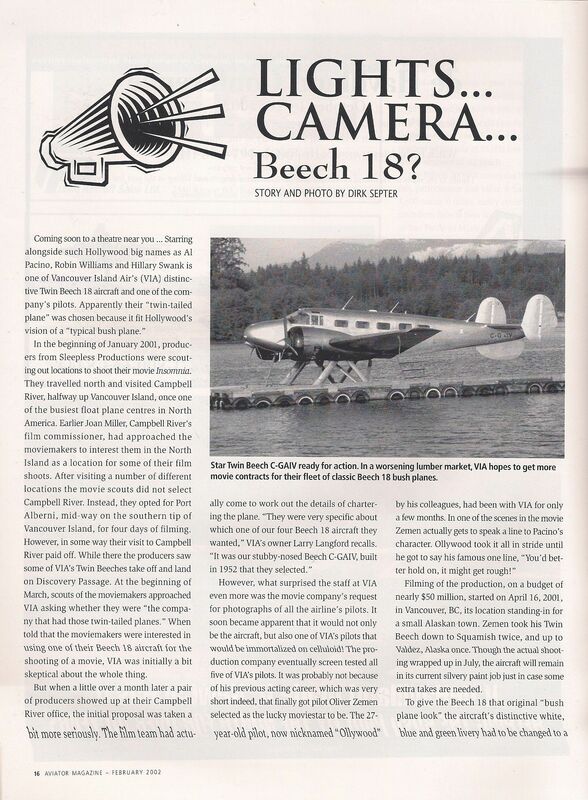 The quoted website has more images of Beech 18s featuring in films, check it out! Received news (Jan.2017) from Vancouver Island; Dirk Septer wrote me some big DHC-3 parts were noted of an Ethiopian AF Otter. 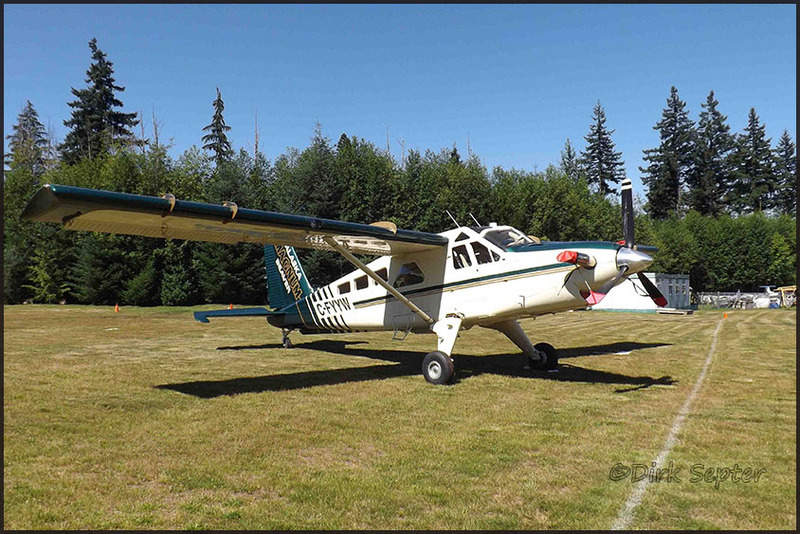 Wondering what is in that big blue shipping container to which this partial former Ethiopia Air Force Otter is tied to? Updates will appear in due course on Dirk's gallery on this website. The four Ethiopian Army Otters that were repatriated to Canada, many years ago, were subject to allegations and court cases. 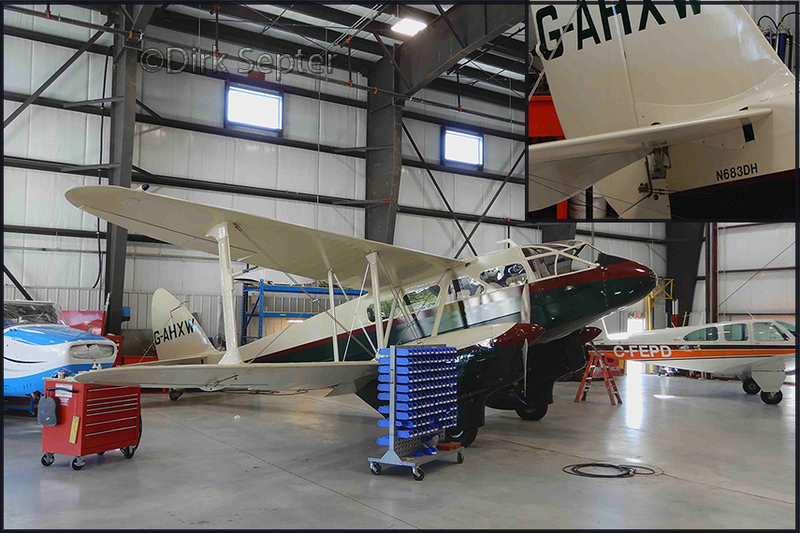 Even during the rebuild of the only one that ended up flying again: s/n 349 C-FZDV (see below photo). The Royal Canadian Mounted Police was called in. Reportedly the Otters were stored, or rather hidden, in a barn somewhere in Alberta. 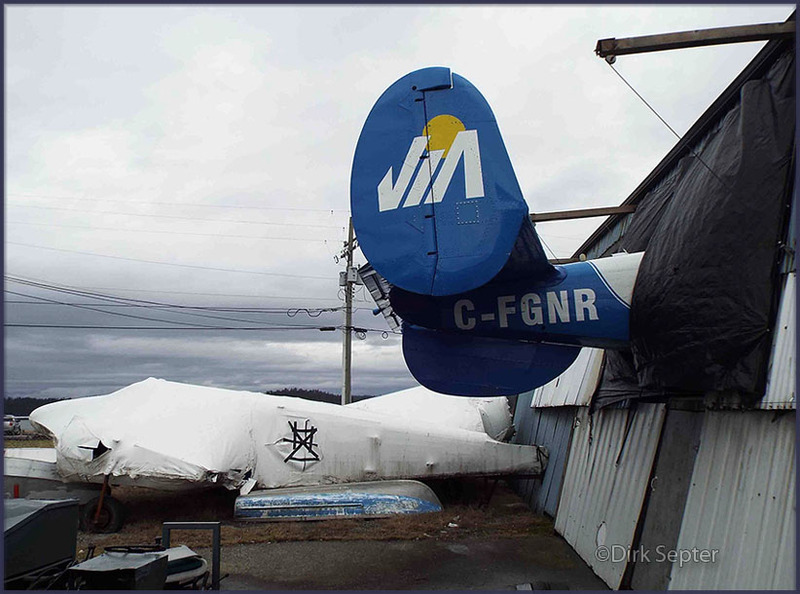 About 10 years ago, at least two of them were observed in a hangar at Vancouver's South terminal, and now this one has appeared in Campbell River. They appeared in fine condition, certainly candidates for rebuild! The fact that these four Otters never carried a civilian registration may add to the difficulties of having them rebuild and registered. 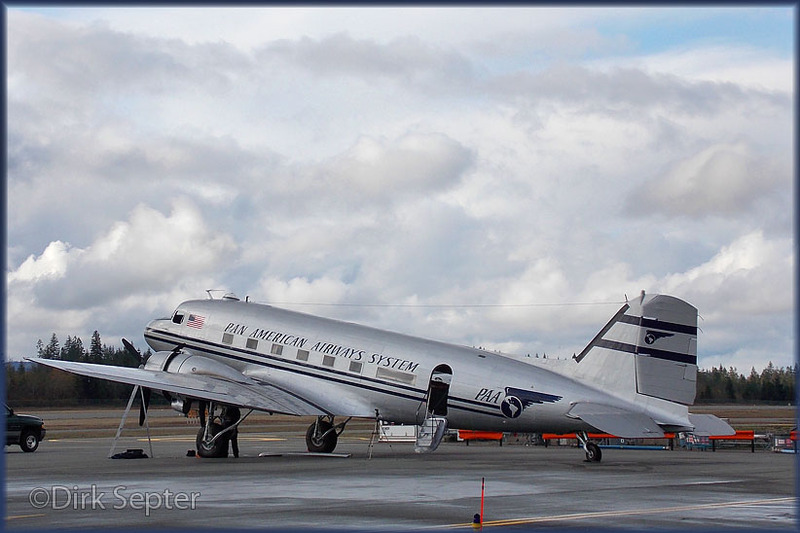 Beech RC-45J Expeditor owned by Historic Flight Foundation, Mukilteo,WA; Bu.No. 29585 (c/n 7121), showing the markings of the Naval Air Technical Training Unit (NATTU), NAS Pensacola. optical glass for the cameras and vacuum tube radios. 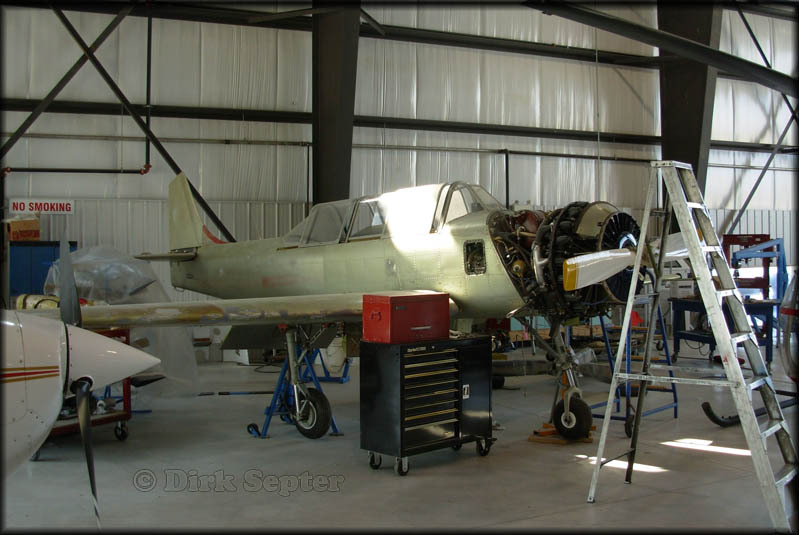 In 2014 I visited the Historical Flight Foundation, see my report HERE... It has a full report on this fine RC-45J. 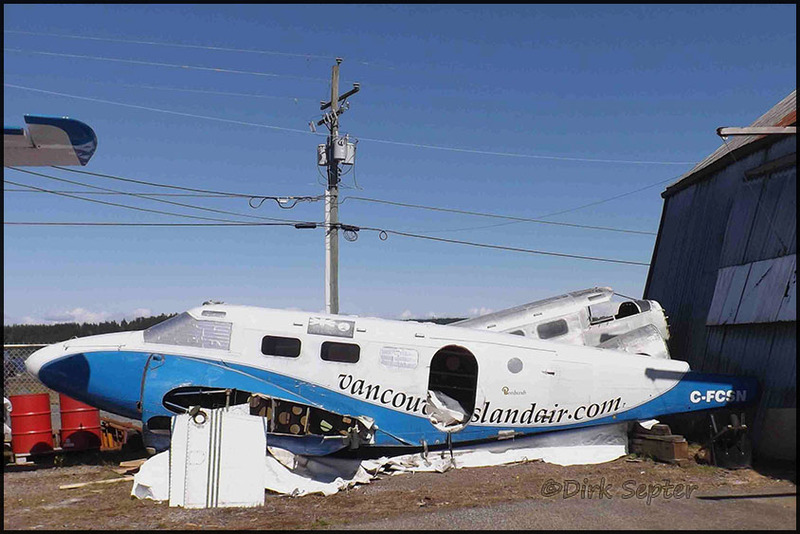 It was still here at Campbell River in May 2017, the engines had been taken off. Dirk also sent me these images, he provided the data with them. All photos were taken 17Jul16, except that shot of FYYW, taken on 16July16. 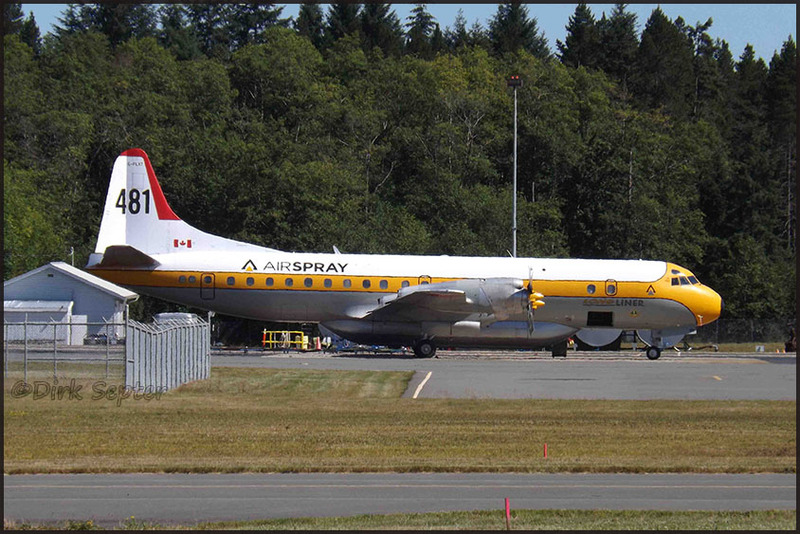 Air Spray's L-188 Electra C-FLXT c/n 1130 stationed at Campbell River YBL this summer. We had a very busy and costly early wild fire season in 2016, but now things slowed right down (-august 2016). Dirk sent me these pictures in May 2016, they were taken on 29Apr2016 and represent sad news! Dirk wrote me: "These pics I took on 29Apr2016, of VIA's C-FCSN; it has already been scrapped and dumped. VIA's Larry Langford is a real fan of the Beech. He is quoted in Robert Parmerter's ultimate Twin Beech book, "Beech 18 - A Civil & Military History', as saying: "We like Beeches here - they're one helluva airplane. It's got the best radial engines ever built. Customers love it, pilots love it, and dispatchers love it! Point the nose up and it climbs, unlike the Beaver where you always seem to be struggling for that last 20 feet per minute." Must have been a hard decision for Mr Langford to take, scrapping these Twin Beeches..
Dirk wrote a profile of the Beech Seawind here on my website: LINK, that page has the text and the article Dirk wrote for Aviation Quarterly's Spring 2002 edition on the Sea Wind conversion. Subsequently, she was sold to Bruffey Flying Service, WV, being used for skydiving. in April 2007, after one engine failed after take-off. Vancouver Island Air (Campbell River, BC) has now disposed of its last Twin Beeches. An end of an era! Last year they managed to sell their C-FGNR to Belgium. For this see my Off-airport Europe. They had two left, neatly wrapped up near their base for a number of years. Unable to sell them, VIA decided to finally dispose of them. C-GAIV starred in the 2002 movie 'Insomnia' (starring Al Pacino). In this movie, one of VIA's pilots, who during a flight (supposedly to Alaska), turns around to his two passengers in the back and warns them with the famous words (his only text! ): "You'd better hold on; it might get rough!" 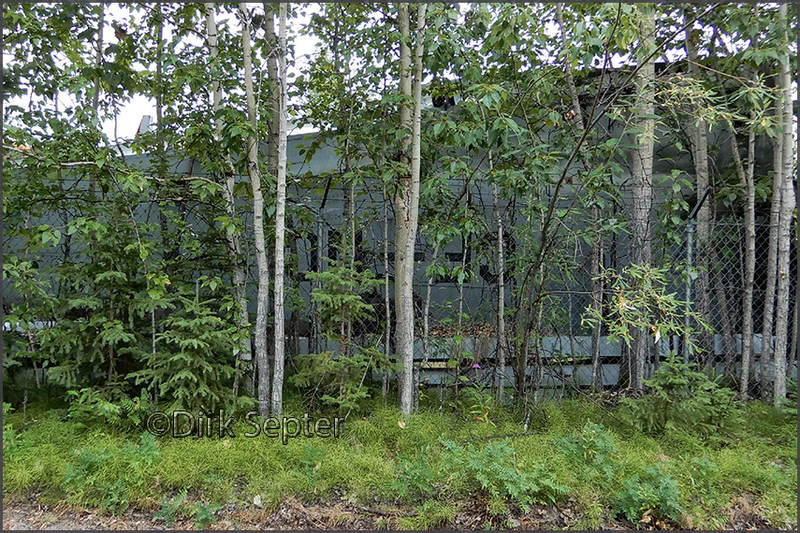 "Two images of Tyee Spit's new resident: C-FQND. I still love those classic DHC paint schemes; and they still look good on the turbine conversions. Am wondering whether VIA is going to fork out the money to repaint her?" deHavilland DHC-3 C-FQND c/n 233, Vazar-turbine equipped. Otter 233 was delivered to the United States Army on 12Feb1958 with serial 57-6114 (tail number 76114). It was one of 16 Army Otters delivered from Downsview to Addison,TX for work to be done on them by Collins Radio Corporation. Most of these Otters were then delivered to Europe, including 76114, which underwent overhaul at the SABCA plant at Gosselies (near Brussels) in Belgium during September 1960. This company performed maintenance on Army aircraft under contract with the Army. By January 1962 the Otter had joined the Military Assistance Advisory Group (MAAG), Rome, Italy based at Rome's Ciampino Airport. It flew alongside a USAF C-47, which was also serving with the MAAG Flight. Kenneth Ketzler flew the Otter. Apart from trips to Brienne-le-Chateau, France for maintenance, all his flying was within Italy, often visiting Italian military bases where US-supplied helicopters were being introduced and MAAG personnel were working with Italian army aviation units on these helicopters. There were also VIP flights and personnel transportation which took the Otter all over Italy, from the mountains in the north down to the Mediterranean. As he recalls: "Ice seemed to cause me more concern than anything else. I especially remember several times flying IFR between Florence and Bologna at the lowest altitude of 12.000 feet and seeing ice forming on the wings. Flying over large bodies of water on one engine is not exactly my cup of tea. Seemed like the engine always ran rough whenever there was a trip to the islands of Sicily or Sardinia." 76114 continued in service with MAAG Italy until February 1966 when it headed south to a new posting, with the United States Mapping Mission to Ethiopia, based at the 'old airport' at Addis Ababa. For this tasking the Otter was re-painted from the standard olive drab it had flown in while in Italy, to the white/red colour scheme used by Army aircraft on survey work. It joined some Beavers with the Mapping Mission (76143 and 82026), a Douglas C-47 (17203) and UH-1B Huey helicopters, all of which were engaged in a topographic survey of Ethiopia. The Ethiopian Army had received some Otters under a Military Aid Program and they were also based at the same airfield, making it quite an important Otter base. 76114 was noted there in June 1969, just prior to its long flight north to Coleman Barracks, Mannheim, Germany from where it was transported back to the United States, to the Sharpe Army Depot, Stockton, California where it arrived in August 1969. After overhaul at the depot, it was assigned in March 1970 to the Aviation Section at Fort Ord,CA used as a maintenance support aircraft. It remained in service at Fort Ord until June 1975, when its Army career came to an end. 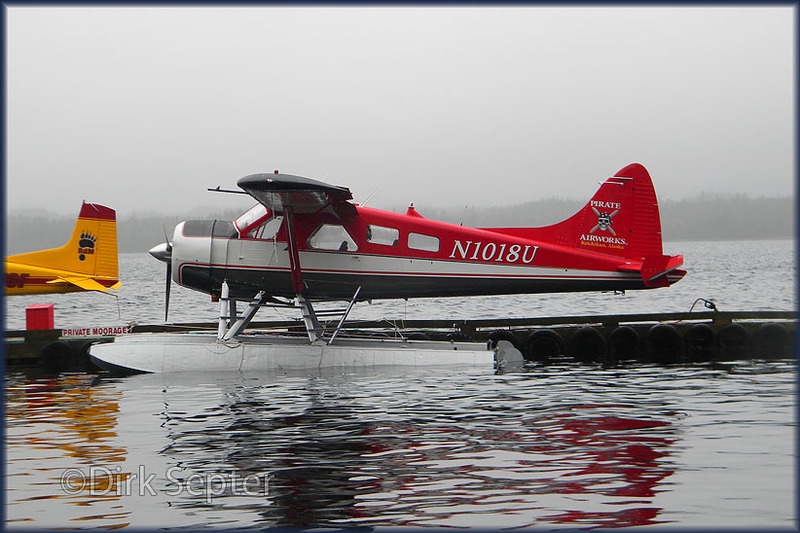 The Otter transferred to the Civil Air Patrol (CAP). It received its civilian Certificate of Airworthiness on 16Jul1975 and was registered N5325G, being assigned to the CAP's North Central Region. It was painted in a garish red, white and blue bicentennial colour scheme. Its service with the CAP was brief, as in Dec.1976 it was sold to Island Airlines of Port Clinton, Ohio by an aircraft dealer in Tulsa, Oklahoma. 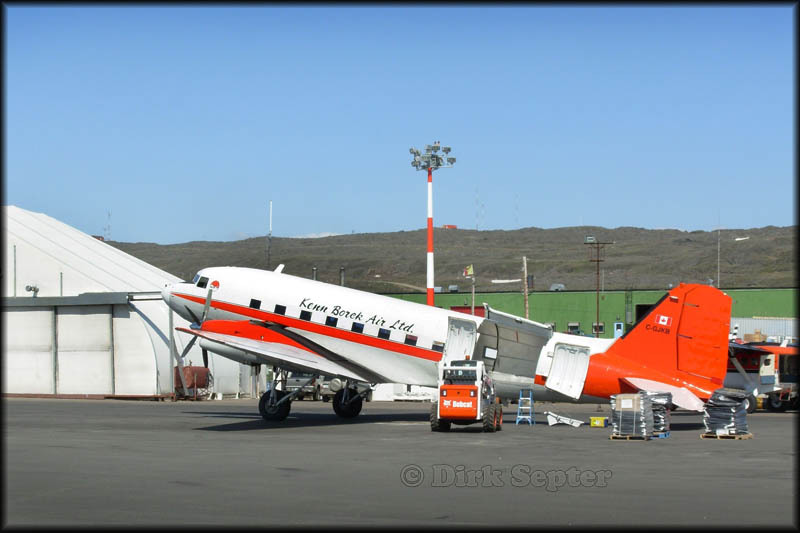 When it arrived at its new base it was repainted in the house colours of Island Airlines and joined the other members of the fleet, Beaver N62352 and Ford Tri-Motor N7584. The Ford was used for sight-seeing flights but the Beaver and Otter flew Island Airlines scheduled services from Port Clinton, located at the western end of Lake Erie, to islands in the lake, Kelley's Island, Put-in-Bay, Middle Bass and North Bass. This unique operation styled itself 'The Shortest Airline in the World', with some justification. Departing from Carl Keller Field at Port Clinton, the Otter took all of seven minutes to complete the scheduled flight to Put-in-Bay, and a similar time for the return sector. As Edward J.Rusch, the company's Chief Pilot, said 'The Otter works the rough sod and stone fields of the islands very efficiently'. By March 1981 the Otter had a total time of 4,833 hours on the airframe. On the scheduled services to the islands, the Otter (or Beaver, depending on the load) carried the resident population year round; tourists during the summer as well as migrant Mexican labourers for fruit picking; and fishermen during the winter for ice fishing. The Otter also carried mail and freight and performed medevac flights, averaging several each weekend during the summer, as tourists injured themselves. The islands' policeman acted as a paramedic and accompanied the patient. 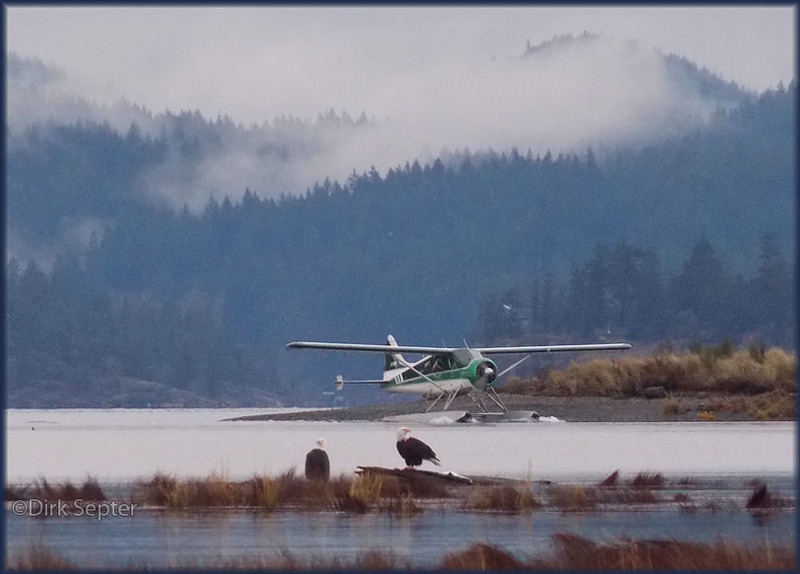 During the winter months, when the lake froze over and the ferry no longer operated, these Beaver and Otter flights were the only means of access to the islands. After nearly 16 years of flying with the Otter, this unique operation came to an end. 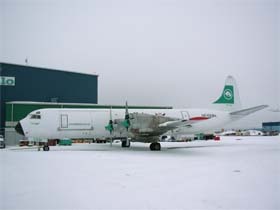 Island Airlines was taken over by Griffing Flying Service Inc of Port Clinton, to whom the Otter was registered in October 1992. The scheduled services were terminated and the Otter put up for sale. 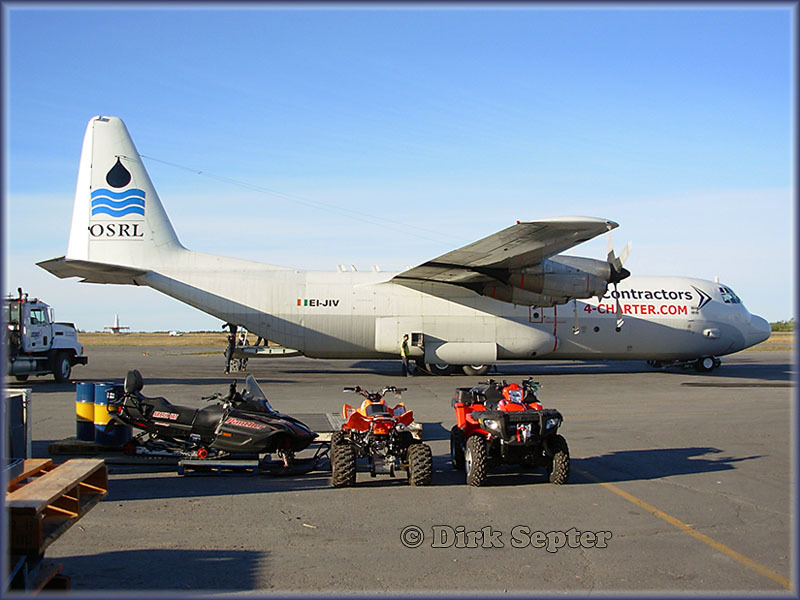 The buyer was Delay River Outfitters Inc, trading as Air Schefferville, to whom the Otter was registered C-FQND on 23Aug93 and it set off for its new base at Schefferville in the remote bush country of Quebec. 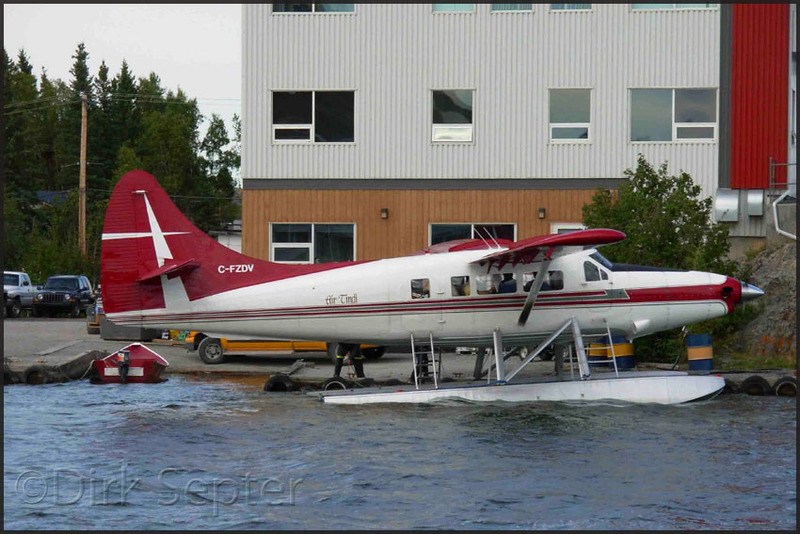 In 1994 the Otter was sold to Waweig Lake Outfitters Ltd of Thunder Bay,ONT, to whom it was registered on 18Apr94. 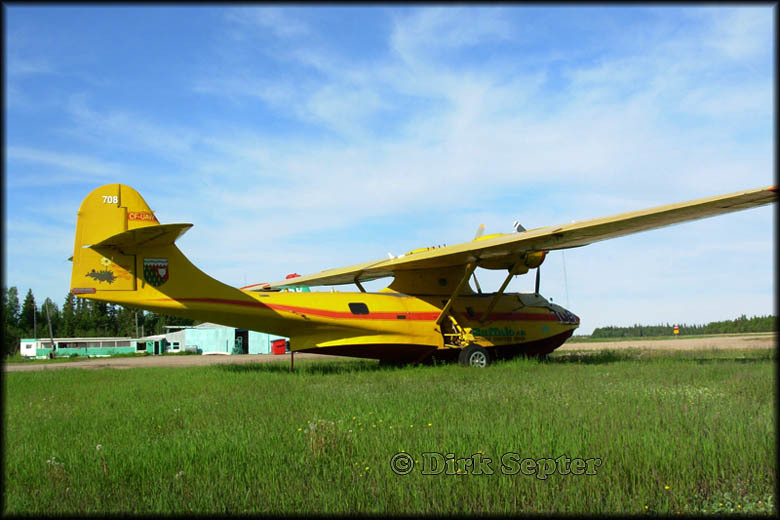 It was converted to a Vazar turbine Otter by Recon Air at Geraldton, Ontario and for the next number of years it would serve at Waweig Lake, Ontario during the summer months, carrying tourists, fishermen and hunters wishing to experience the delights of the Ontario bush country. This business was carried on by Waweig Lake Outfitters in association with Wilderness North Air of Milwaukee. 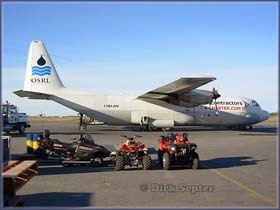 On 06Jun2001 the Otter was registered to 1401380 Ontario Ltd (Waweig Air) and continued in service in the Ontario wilderness. 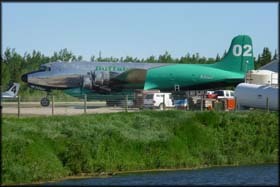 Early in 2002, Otter 'QND undertook a unique 'Flight of Friendship' tour of 35 US cities, sponsored by Wilderness North Air. The tour certainly brought the Otter to many places which usually did not see much Otter activity. On completion of the tour, QND resumed its flying in the Ontario bush country for Waweig Air. 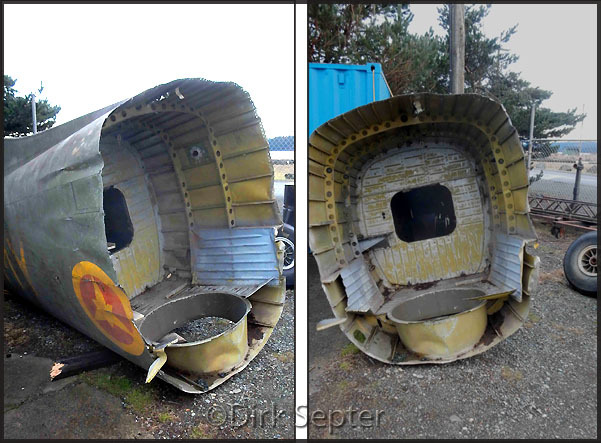 Dirk spotted B-25D 'Grumpy' at Sealand Aviation (Campbell River, Vancouver Island) 26Oct14. 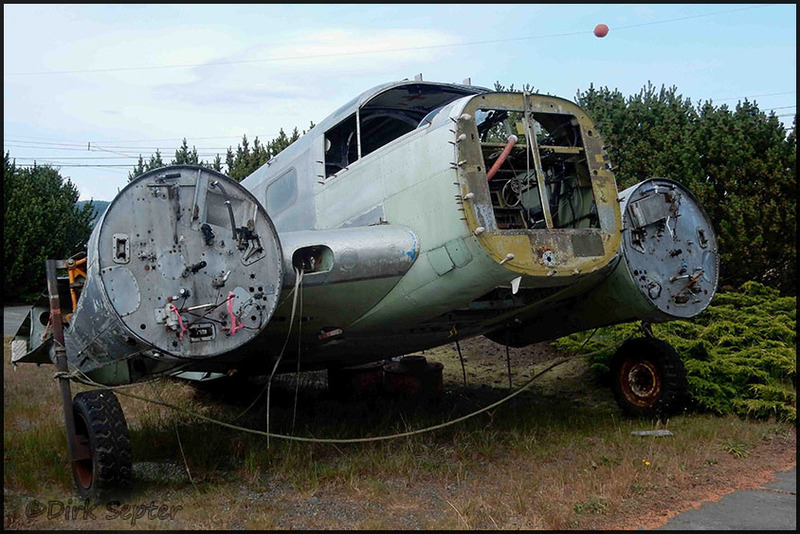 This Mitchell WWII bomber 43-3318 (registered N88972) will get a new paintjob, as an anti-corrosion measure. 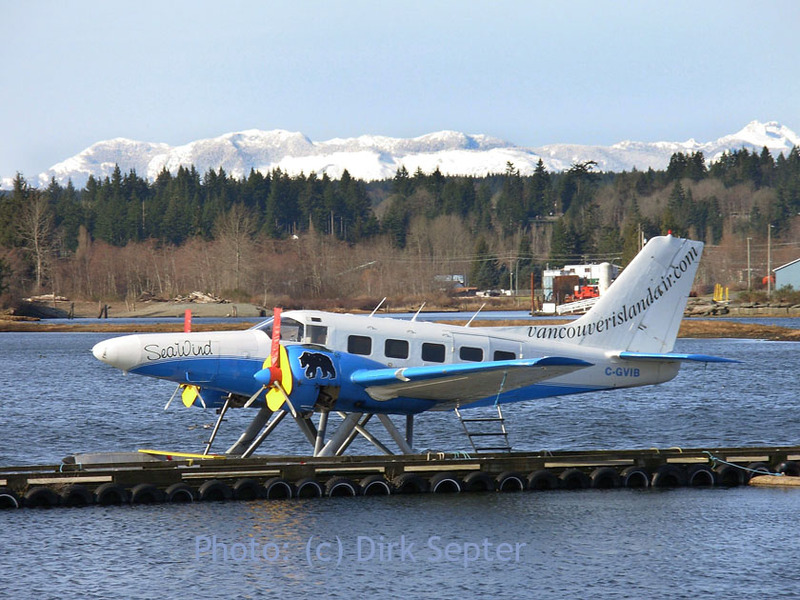 March 2014: "Vancouver Island Air (VIA), till recently known for their fleet of Twin Beeches on floats, is now a totally turbine Otter operation. UPDATE: 'GNR was sold and flew across the Atlantic Ocean to Belgium, where it arrived in July 2015. See an item on Photos by Friends & Guests (43). 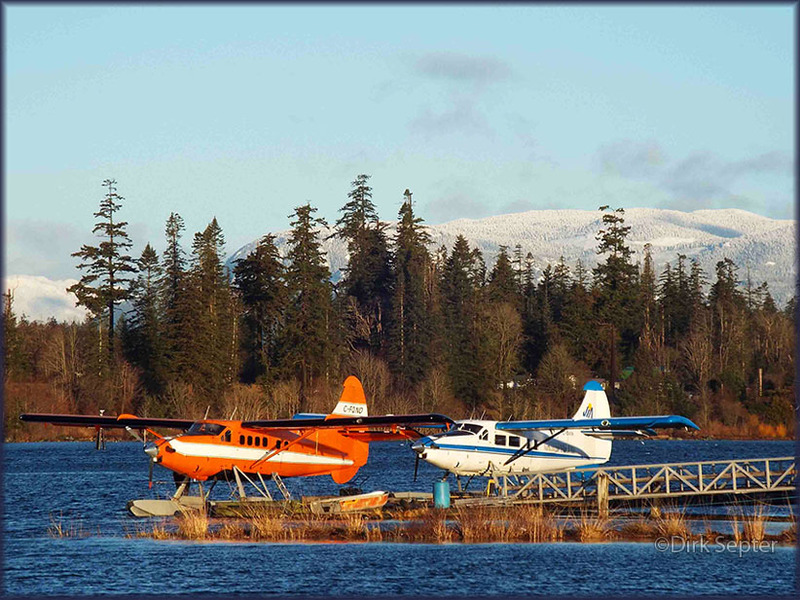 "Vancouver Island Air is Campbell River’s premier seaplane company safely serving coastal British Columbia since 1985. 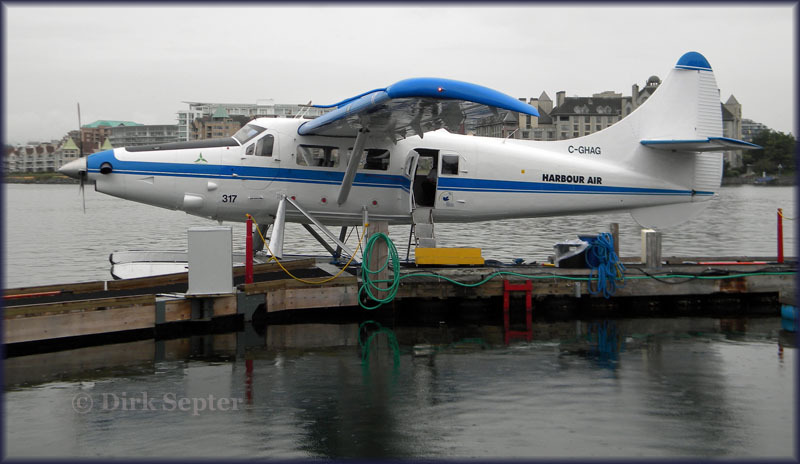 We operate two DeHavilland Turbo Otters. Our aircraft capacity is 1-26 passengers’ large groups can be accommodated. Our location is a 3 hour drive north from Victoria, the capital city of British Columbia, Canada. 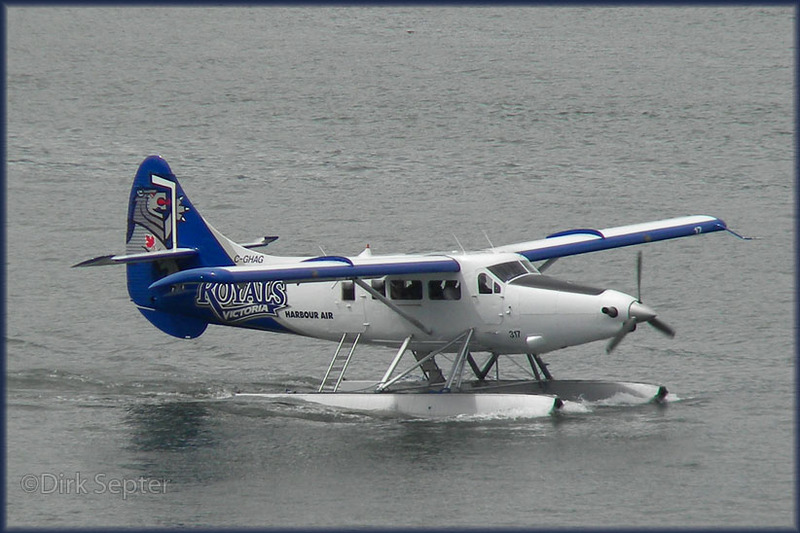 If you are visiting Campbell River for the first time or have been many times, we recommend taking an air tour with us! 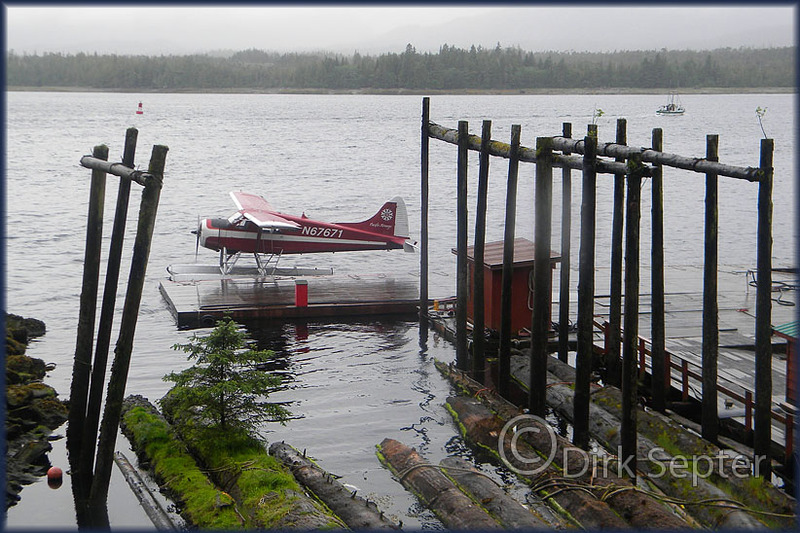 Your flight will take you to some very remote locations, in some cases only assessable by boat or floatplane." 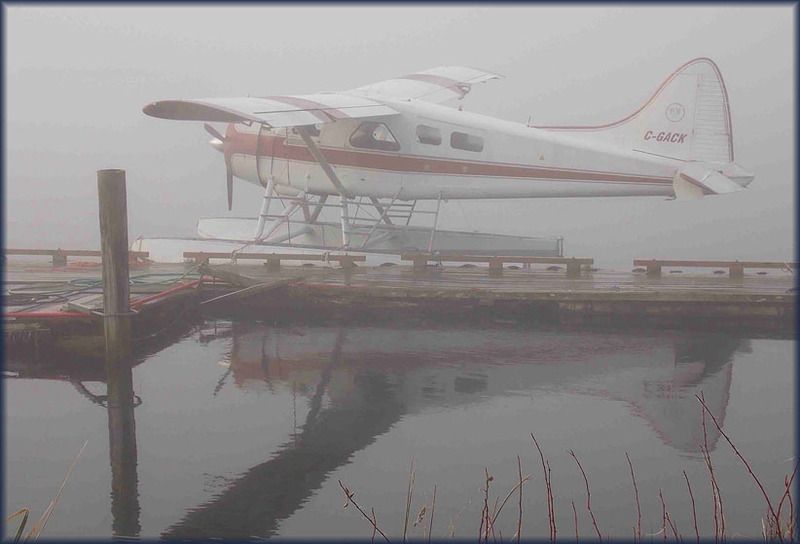 DHC-2 N1108Q at Campbell River on the dry..
N1108Q was reg'd to Promech Inc. (of Ketchikan,AK) on 07Oct05, so what is it doing here..? 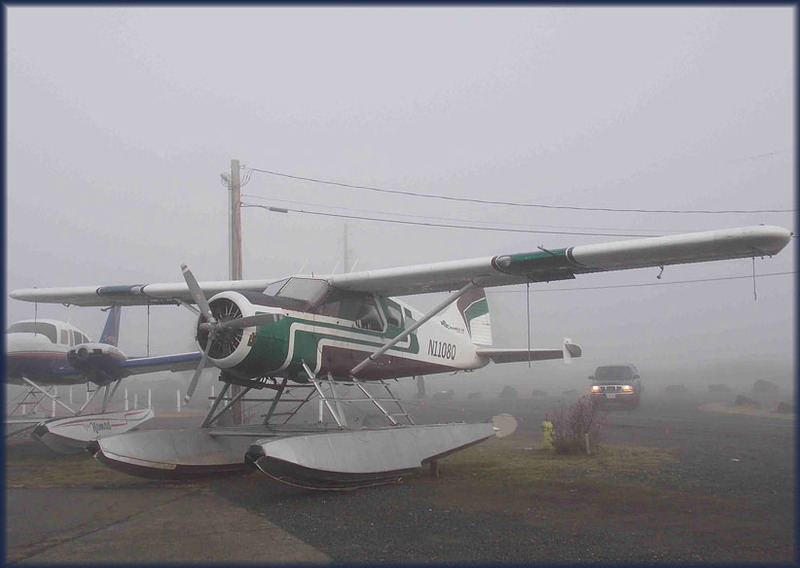 "We've had some really foggy days lately here at Campbell River, the kind we often get in the Fall. I guess we're actually still in the Fall as we haven't had any real Winter yet! Maybe we're even already in the Spring... My crocuses and snowdrops are blooming, while there are even some Fall flowers blooming still as well. The biggest climate change is happening in the Arctic; we had another mass migration of snowy owls come through (second year in a row) due to the collapse of the lemming population up North. When the owls get here they are so weakened that they pretty well all die within days! Really sad. Even the bald eagles are starving due to the collapse of the salmon stocks in the ocean, mainly due to rise in temperature." DHC-2 C-GACK (c/n 711) at the Spit, Campbell River,BC. 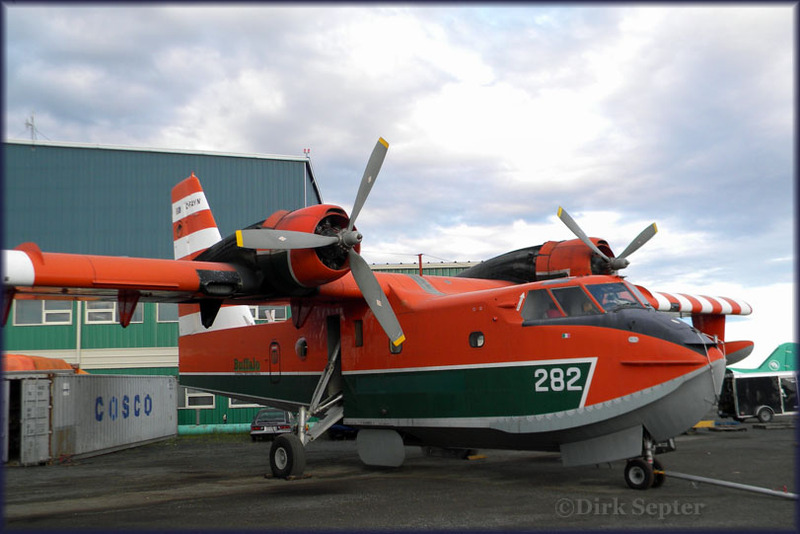 In due course visibilty will be restored, all one can do is wait..
"Here is an unusual visitor to Yellowknife, Northwest Territories on 10Jul12: Ontario-based Seabee CF-GAD (s/n 965)." 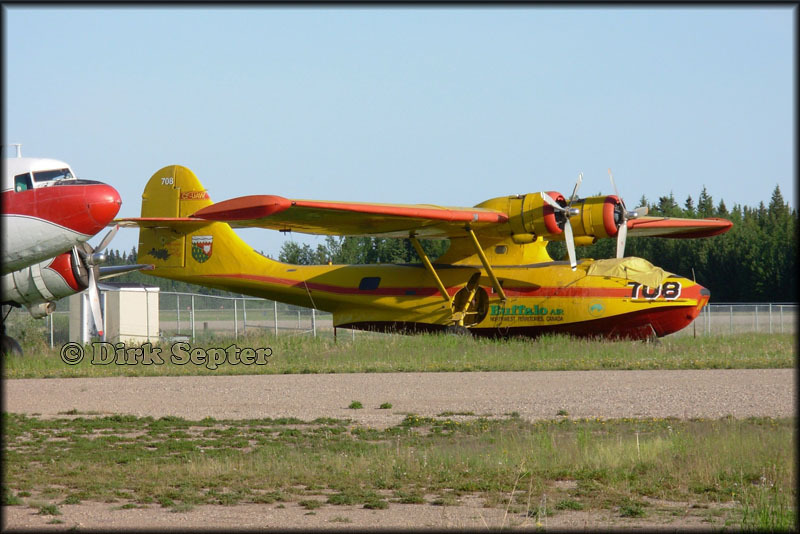 When I came upon a SeaBee myself, at Sioux Lookout (2007), I wrote some background info on this remarkable plane. 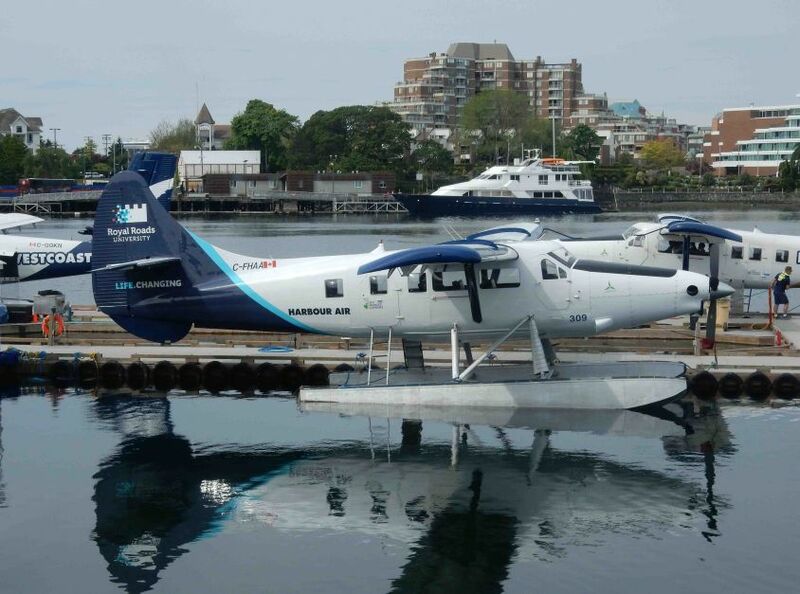 "Over the past 25 years, the Grumman Goose has been the flagship aircraft of the Pacific Coastal Airlines Seaplane division based in Port Hardy. During this time, the ‘Goose’ has proven to be a reliable effective workhorse for the fleet and has done a great job doing the type of work needed to serve the many communities, logging camps and fishing resorts on the rugged Central Coast. 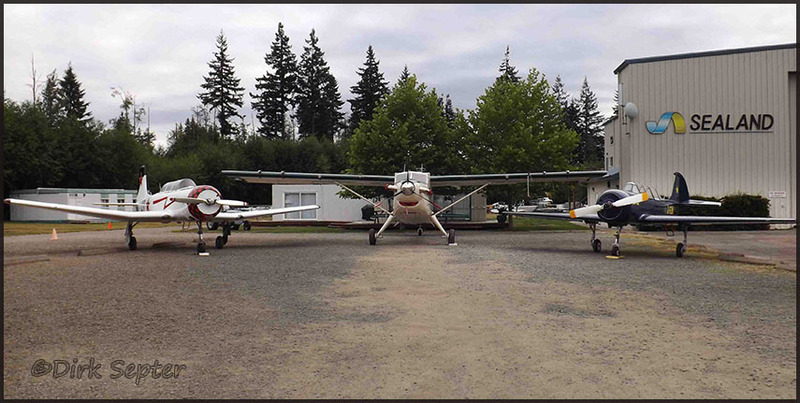 As the aircraft age, our inability to acquire certified parts has made it impossible for us to continue to maintain and operate the Grumman Goose to Pacific Coastal Airlines and Transport Canada standards. This obstacle puts the ongoing, long-term viability of operating the Grumman Goose into question. With this in mind, we have made the decision to park the Grumman fleet while we determine the options before us in relation to accessing certified parts, as well, we will be evaluating the ongoing sustainability of the aircraft. In the meantime, we are working at providing short-term alternative solutions with a goal of having a clearly defined long-term plan in the near future. The Grumman Goose has been such an icon for Pacific Coastal Airlines; making a decision like this does not come without a sentimental sense of loss, however, we feel it is an important step in the ongoing evolution of our company and I look forward to the next chapter in our world." 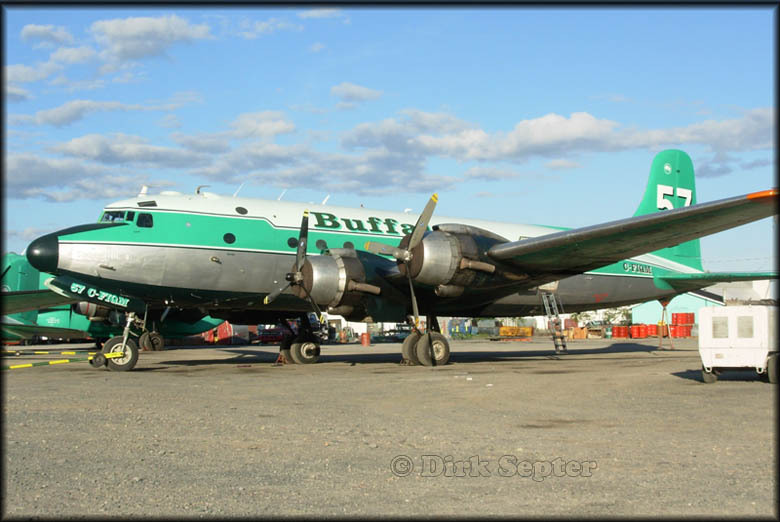 Dirk wrote: "I noticed the tail section of Merlyn Carter's Model 10-C Electra CF-HTV (c/n 1005) in the Buffalo Airways' yard in Yellowknife. 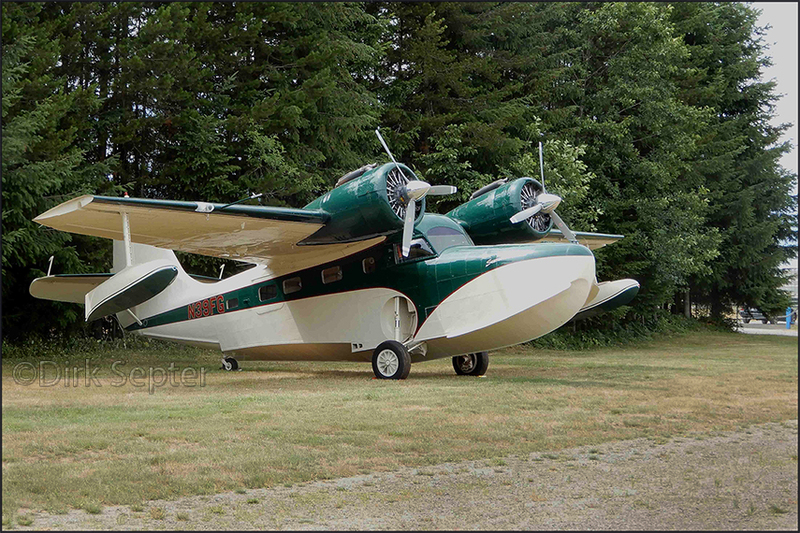 Carter bought this aircraft in March 1964 to haul fish. It burned in July 1972, near Birch Lake,NWT. 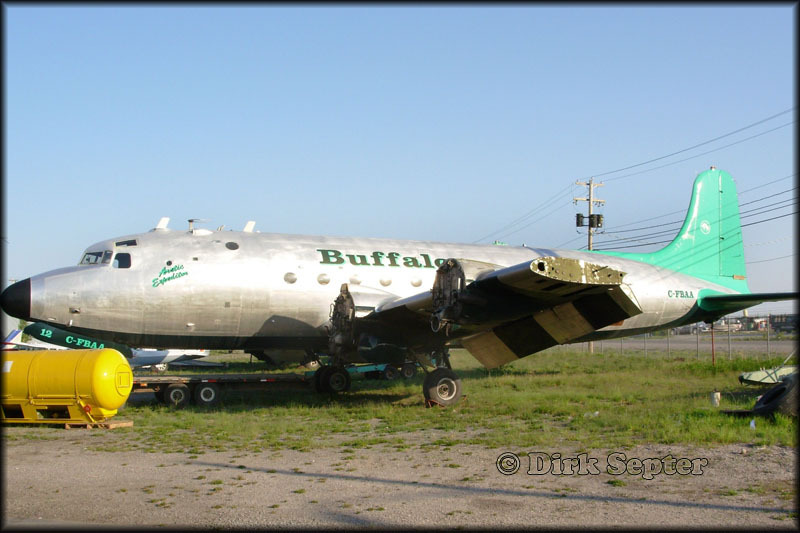 Interesting history: it was originally NC14258 of Pan American Airways." deHavilland DHC-2 N67671 (c/n 489) of Pacific Airways; reg'd since 01Feb06 to Radial Power Enterprises. 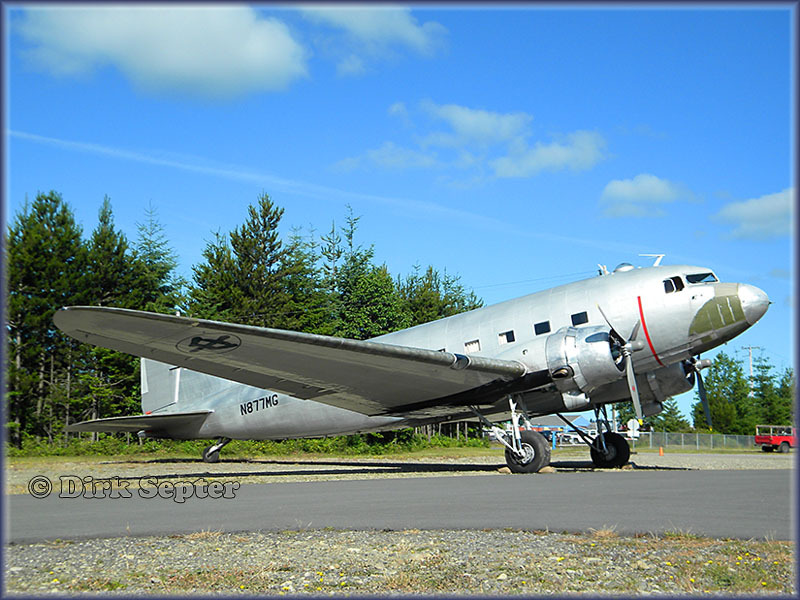 d DHC-2N1018U (c/n 1381) now in Pirate Airworks colours; reg'd since 06Mar12 to Ten Eighteen U LLC. Tail nos. 401 C-FBNW (s/n 1759); 402 C-GBFA (s/n 1781); 403 C-GDUL (s/n 1578); 404 C-GDUN (s/n 1581); 406 C-GGNZ (s/n 1690); 407 C-GTLD (s/n 1722); 408 C-GYMX (s/n 1665); C-GCUK (s/n 1762) and C-GJVN (s/n 1640) and one with a larger loading door C-GFNW (s/n 1758; fleet no.405, but I've never seen it applied to the aircraft). 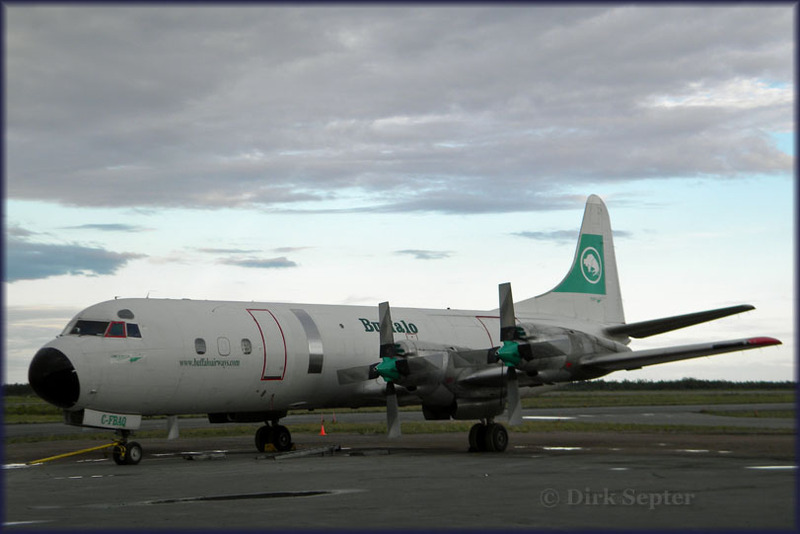 Gradually First Air replaced the Hawkers with more modern ATR-42s; C-GTLD and C-GFNW were the last two Hawkers operating out of Iqaluit, with the latter still there in 2008. I have colour slides of all of the above, but since I only acquired a digital camera in 2006, I only have digital shots of these last two. 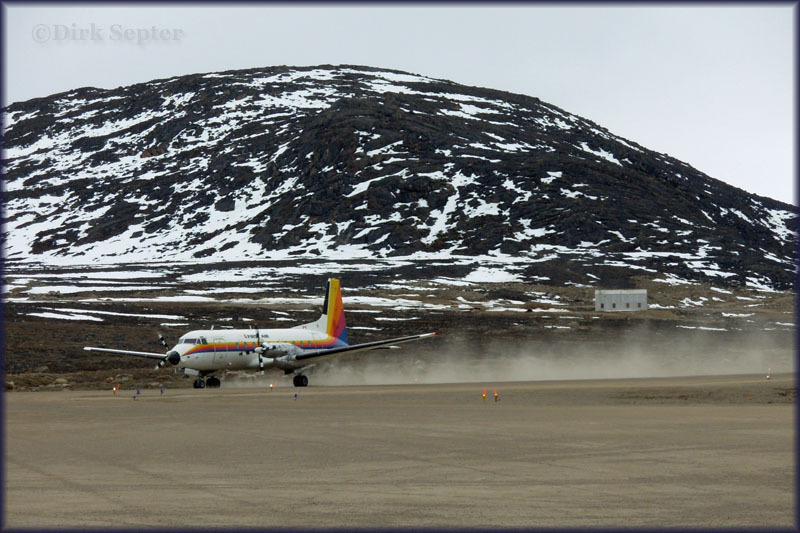 On 06Jun05, I happened to be a passenger on the very last revenue flight of C-GJVN, flying from Igloolik (CYGT) via Hall Beach (CYUX) to Iqaluit. The aircraft had just enough cycles left to eventually fly back to First Air's home base of Carp, Ontario awaiting disposal. The flight crew was so kind as to sign one of the aircraft's safety cards for me as a souvenir of the historical last commercial flight segment!" 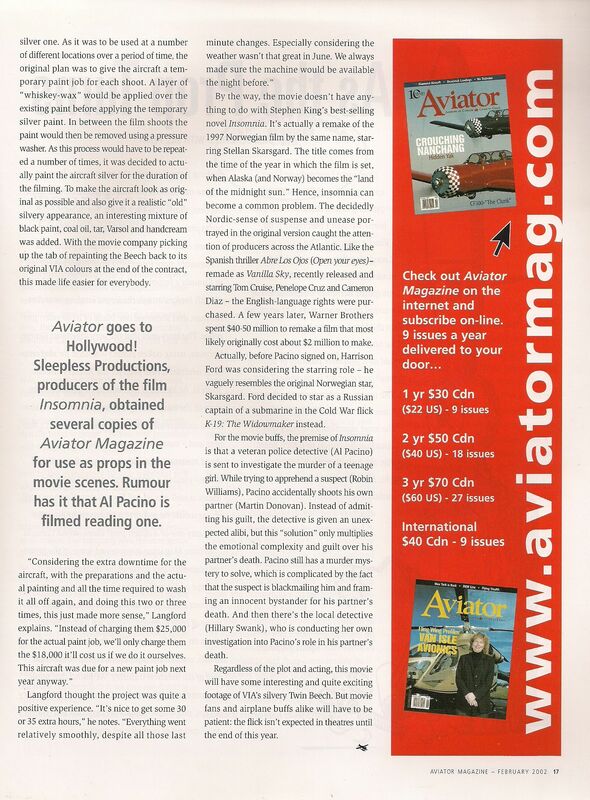 "Bob Baglow, the publisher/editor of the discontinued aviation magazine Aviation Quarterly and later renamed Aviation Canada, has started a web site www.CanAero.ca on which he posted the work of the previous writers and photographers of his magazine. The articles and photography include my ATR-42/HS-748 photography ('Swansong of the Hawkers'), as well as excellent shots by Rich Hulina!" As Air-Britain’s specialist on the HS748, Richard J. Church wrote his comment on Dirk's article. 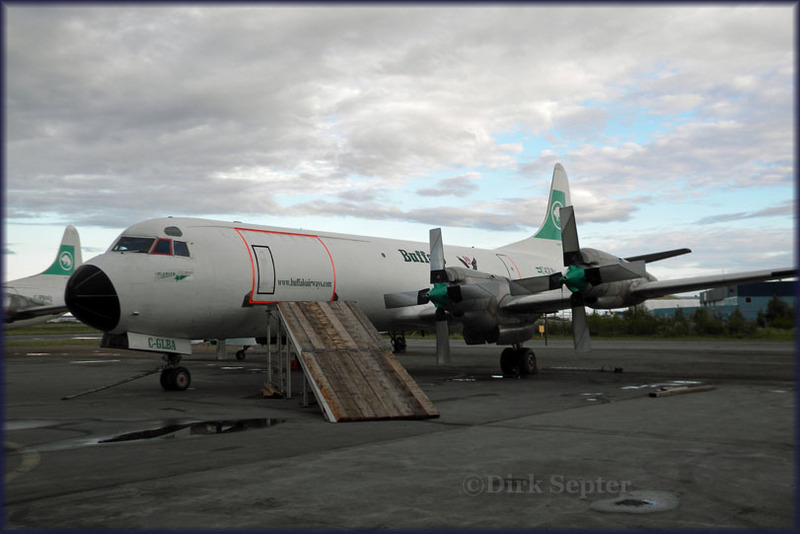 "Their first 748 (C-GTLD) entered service out of Iqaluit on 10th September 1979 after its Certificate of Airworthiness was issued three days earlier. The type inaugurated service between Ottawa and Montréal-Mirabel on 13th March 1981 and between Ottawa and Boston on 17th November 1984. Ottawa was also linked with Rouyn and Val d’Or in the early HS748 days. However in 1990 all scheduled services with the type ended out of Ottawa. 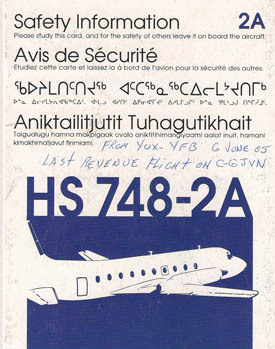 Iqaluit was subsequently linked by the HS748s with Cape Dorset, Clyde River, Coral Harbour, Hall Beach, Igloolik, Nanisivik, Pangnirtung, Pond Inlet, Qikiqatarjuak, Rankin Inlet and Resolute Bay while internationally Nuuk and Kangerlussuak were served. 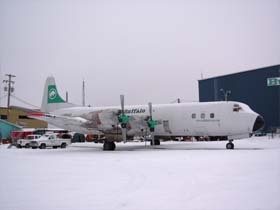 Yellowknife was linked with Cambridge Bay, Gjoa Haven, Holman Island, Kugluktuk, Pelly Bay and Taloyoak and also to the Ptarmigan Airways destinations of Fort Simpson, Hay River and Whitehorse. All these destinations were served on a scheduled basis. 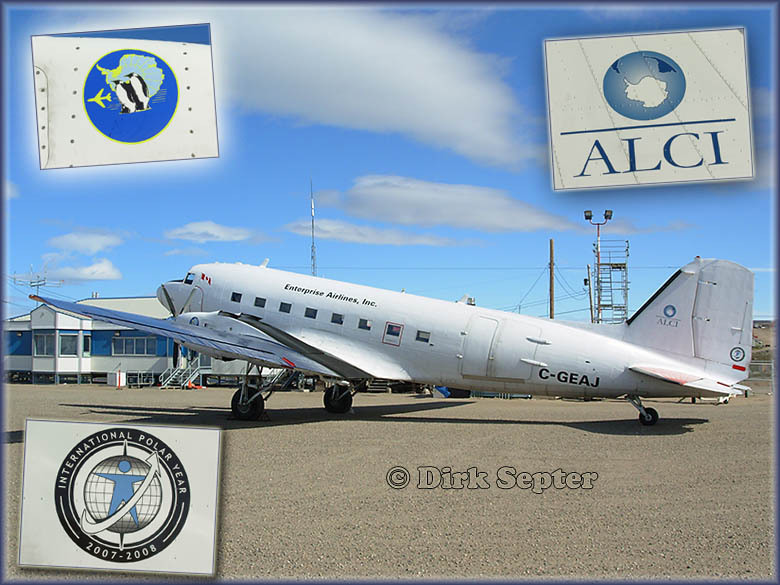 Regular charter flights were flown servicing the DEWline stations from Alaska to Greenland at one time together with many ad hoc charter flights. With your fleet list I have a few comments and a few queries. "C-FBNW also had the larger loading door. I have always shown C-GJVN with the fleet number 406 rather than C-GGNZ but am open to correction. I never traced a fleet number for C-GGNZ. C-GCUK was never quoted as having a fleet number but that was only leased for a relatively short time as also were F-ODTX (s/n 1764), C-GLTC (s/n 1656) and C-GRXE (s/n 1783). Other HS748s owned by Bradley Air Services/First Air were C-GDOV (s/n 1582) and C-GFFA (s/n 1789) while C-GDUI (s/n 1577) was obtained for spares use only. I think that First Air must have had second thoughts on the retirement of C-GJVN. At 27th January 2005 it had amassed 60,012 hours and 54,701 cycles. When it eventually ferried to Trois Rivières, QB (First Air had pulled out of Carp by this time) on retirement on 30th April 2007 it had flown 62,521 hours and completed 56,413 cycles. This was and still is the highest recorded time 748 throughout the world. 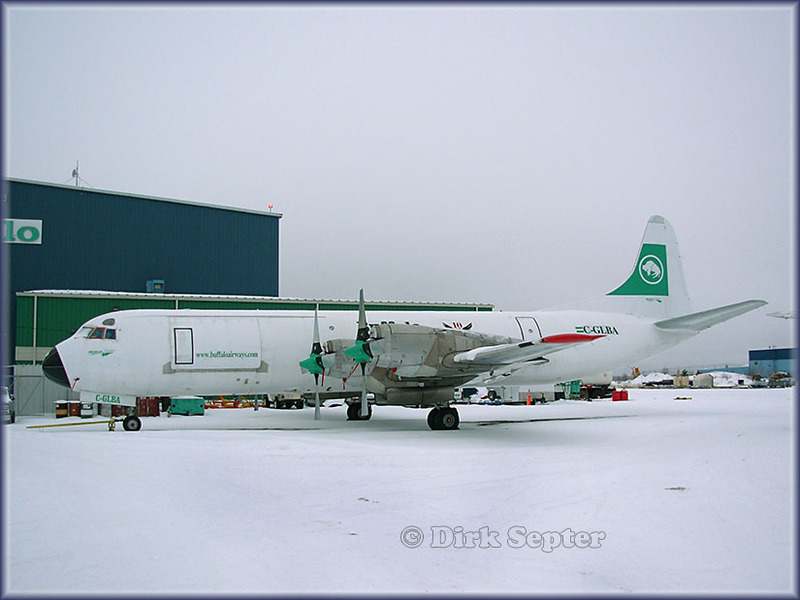 The First Air HS748 era finally came to end when C-GFNW ferried from Iqaluit to Trois Rivières, QB on 15th February 2011 for honourable retirement and possible onward sale." "GGNZ: I have never seen a number of '406' applied on this aircraft; I have a July 1998 slide showing 406, but unfortunately it does not show the registration of the aircraft. All later slides of GJVN do not show 406, rather the 'JVN registration. I do not remember where I got the info as GGNZ being 406, so I cannot argue about your info as 406 actually being GJVN. GCUK leased from Air Inuit? A July 1994 slide shows the aircraft with First Air titles and also shows the larger cargo door; later slides show GCUK with Air Inuit titles." 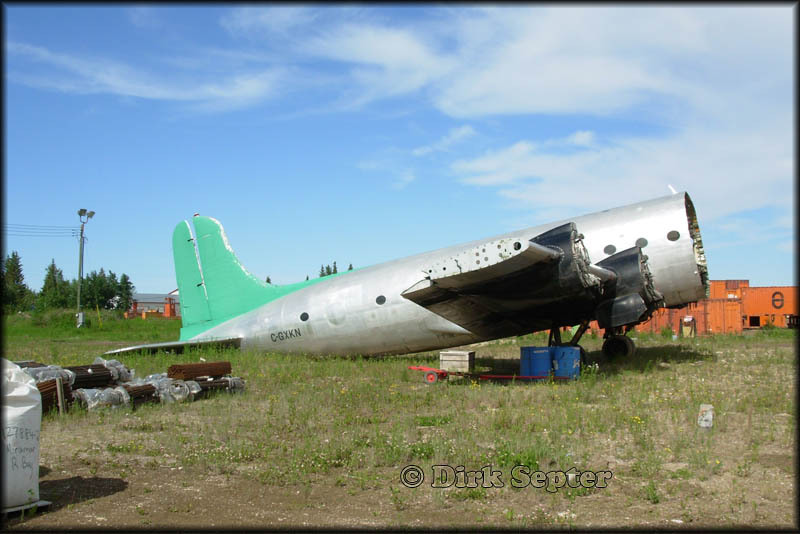 Dirk wrote: "I came across this unusual South African-registered DC-3 ZS-ASN at Smithers, in 1997." 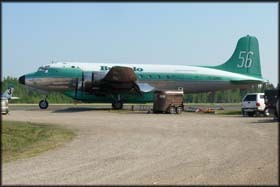 "The DC-3, for obvious reasons nicknamed 'Pinnochio', showed up at the Smithers airport (CYYD) during the late winter of 1997. Four years earlier, this 1947-vintage Dakota had been converted to twin PT-6 Turbo engines at the Basler plant in Oshkosh, Wisconsin. During the conversion, the aircraft's fuselage was strengthened and extended. Its owner, Spectrum Air of Johannesberg, South Africa, was quite tight-lipped about the project. But according the company's Chief Pilot, Australian Peter Hall, Smithers would be used as a base while the company trained some pilots and to work out some bugs in the systems of high-tech sensors for aerial mineral exploration. 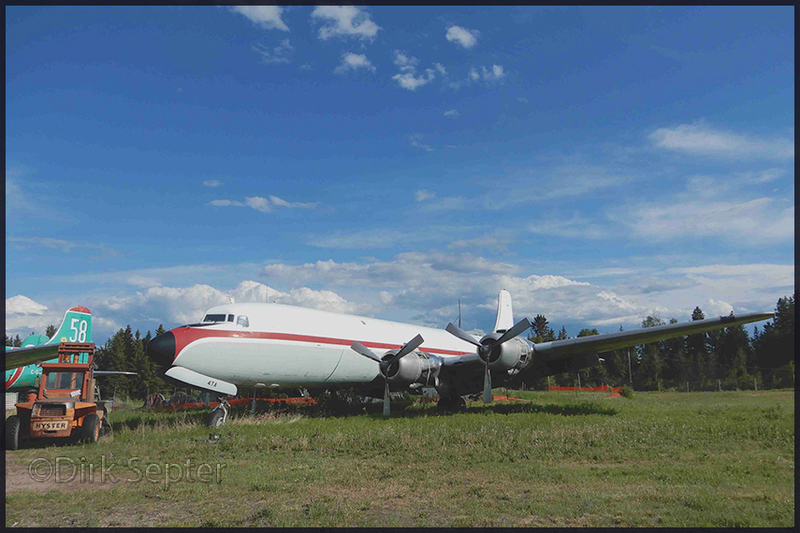 Though the DC-3 had already been used for aerial geological survey work for about two decades, more and more up-to-date equipment had been added inside and outside the aircraft's fuselage. Flying slowly low above the ground, the aircraft acts as a large antenna/receiver, soaking up both magnetic and electrical fields. 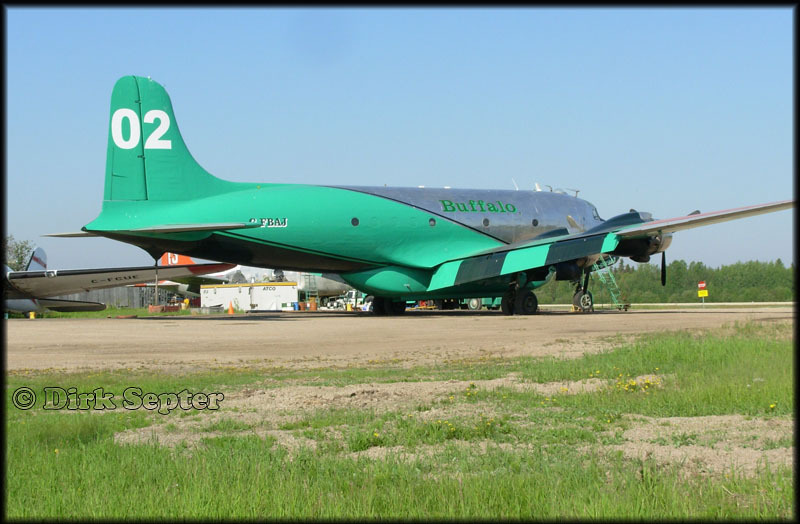 Parameters measured from the DC-3 would include the earth's magnetic and gravity fields and conductivity as well as radiation, such as gamma rays from uranium and potassium. The photograph shows the Hudson's Bay Glacier (a known location of a large molybdenum (moly) in the background. 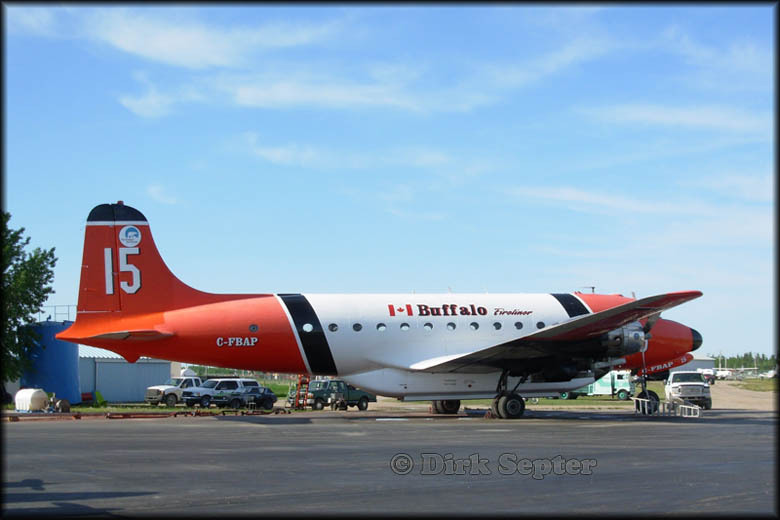 Beech 18 C-FWWV has come full circle by returning to Yellowknife from a long period in northwestern Ontario.This picture was taken at Yellowknife on July 16, 2010. 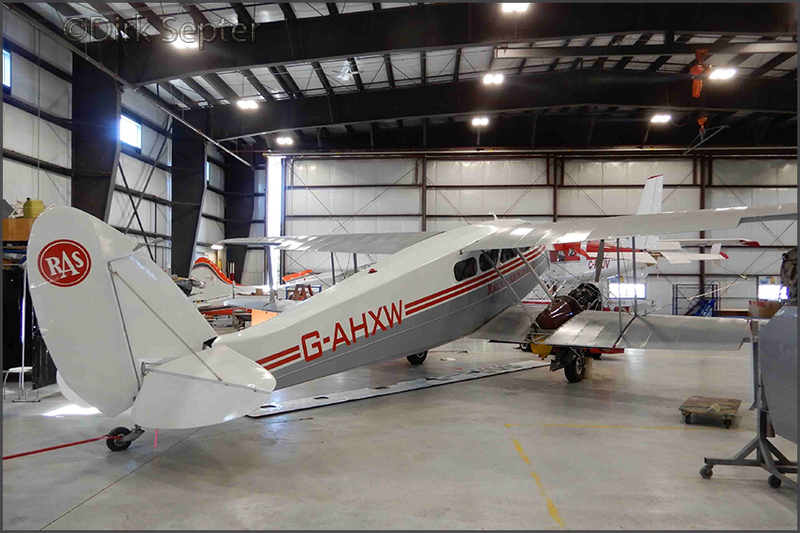 The aircraft is now owned by a tenant, who rents space in Adlair's hangar/FBO at Yellowknife, which in turn is owned by the son of the original owner of WWV, the late Willie Laserich. 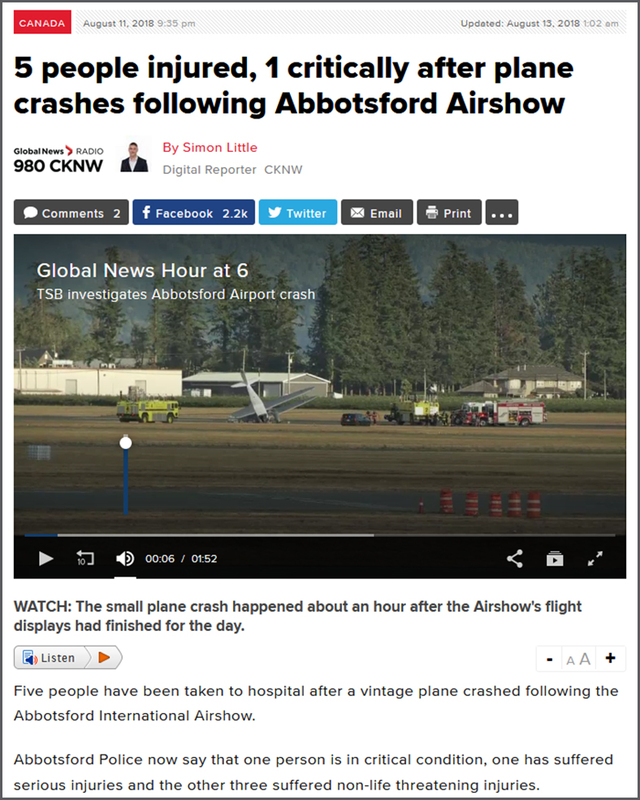 (Note- CF-WWV was registered to David Mathieson of Yellowknife, on 18Mar11; Mathieson is part owner of Summit Air, which now operates a fleet of seven Dorniers and two Skyvans). In 2010, with some 50,000 flying hours with a perfect safety record in the Canadian Arctic, Laserich was inducted in Canada's Aviation Hall of Fame. During his 50-year aviation career, he flew more than 3,000 medevacs, had six babies born in flight on his aircraft and was involved in more than 100 aerial search and rescues in this hostile northern environment, earning him the moniker, 'King of the Medevacs'. 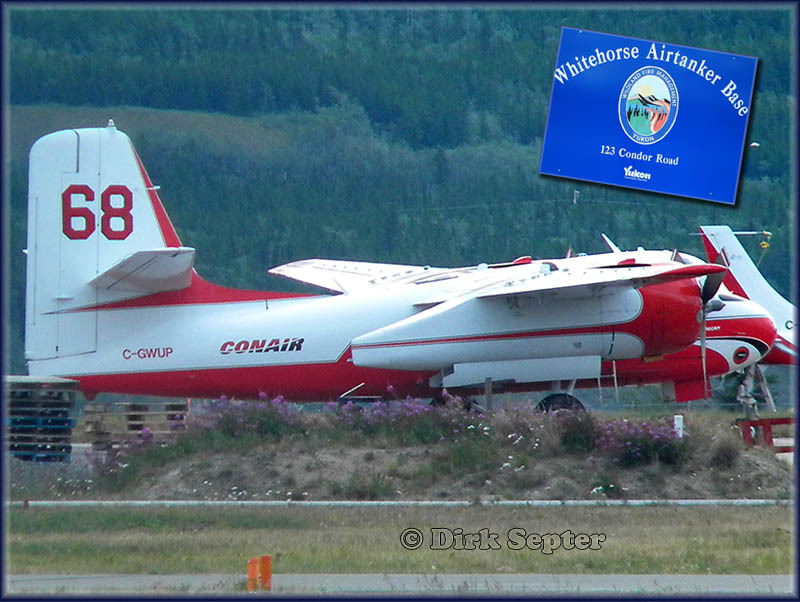 Conair waterbombers 64, 67 and 68 on station at Whitehorse, Yukon (July 23th, 2010). 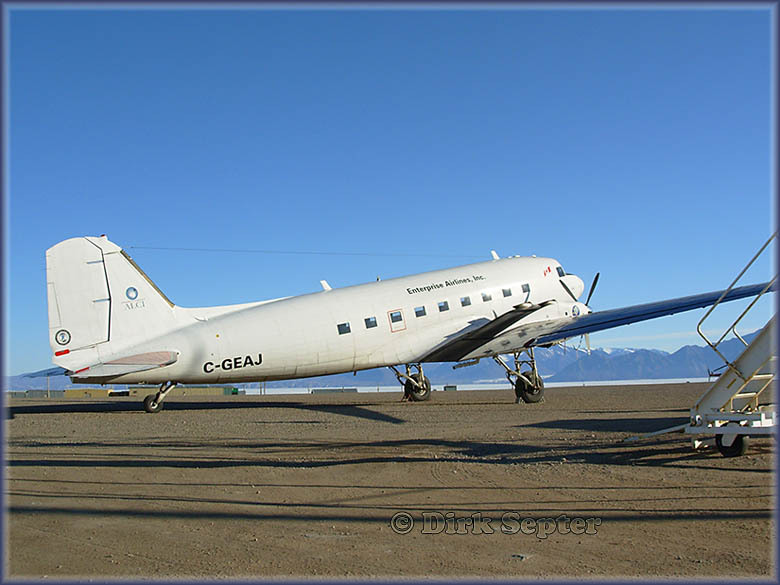 C-FOPU is ex-RCN CS2F-1 Tracker, s/n 1539, c/n DH-38. It was t/o/s by the RCN on 1 April 1958 and s/o/s by the CAF on 12Nov1970. Served with Ontario Ministry of Natural Resources as CF-OPU, #54, in 1972-80. Entered service as Firecat as C-FOPU, #564, (Conair c/n 007) in 1981. C-GABC is ex-RCN CS2F-2 Tracker, s/n 1591, c/n DH-90. It was t/o/s by the RCN on 4 April 1960 and s/o/s by the CAF on 23Apr1971. To Field Aviation as C-GABC-X (for 'on spec' conversion) in 1971 (?). To Arny Carnegie as C-GABC in 1974. 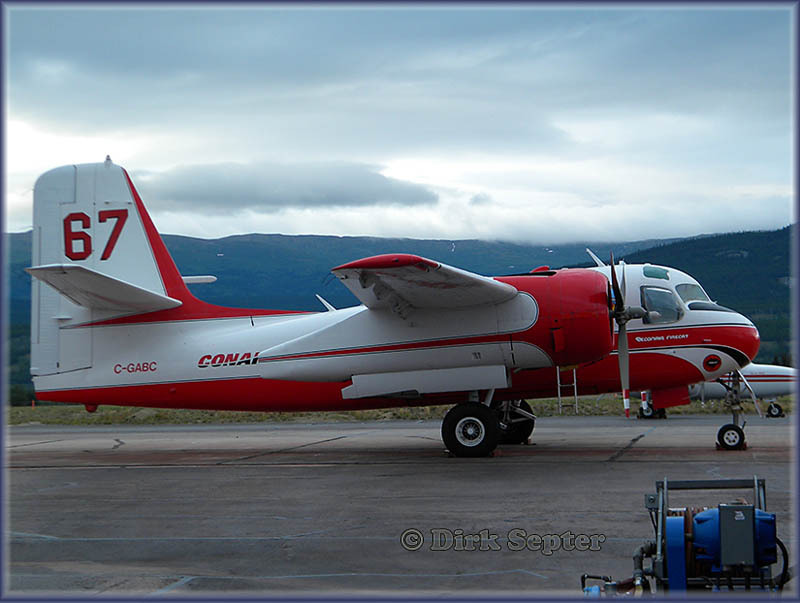 To Conair and entered service as Firecat as C-GABC, #567 (Conair c/n 011) in 1983. 'Old friends' offer final fly-past en route to second retirement; a couple of trusty war birds gave a sentimental farewell to an old home Friday afternoon. With little advance notice, a pair of Conair Firecats performed a 'low and over,' a fly-past above Fulton Field. First built in B.C. 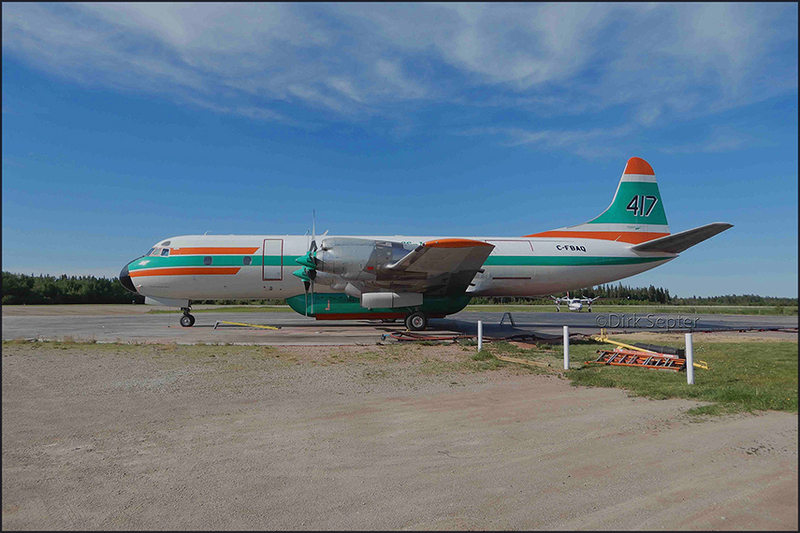 in the 1970s, the firefighting air tankers were headed south from their final duties up North. "Kamloops will remember them," said Jeff Berry, superintendent of the provincial air tanker program headquartered in Kamloops. Three of the twin-engined Firecats were based here from 1975 to 2009, he explained. "They were retired from B.C. in 2009, but they had some life left in them, so they were contracted in the Yukon. This is probably their last flight." 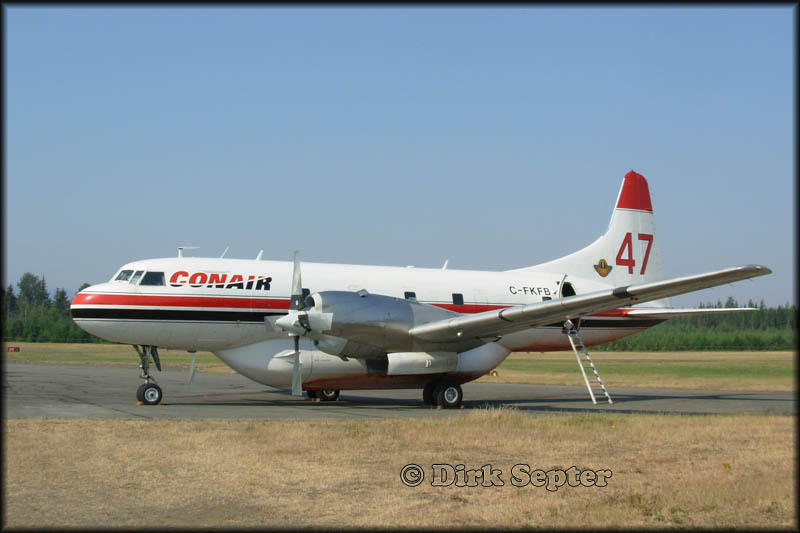 The 'ancient' aircraft were returning to their point of origin - or at least the starting point of their latest incarnation - Conair Aviation Ltd. in Abbotsford. 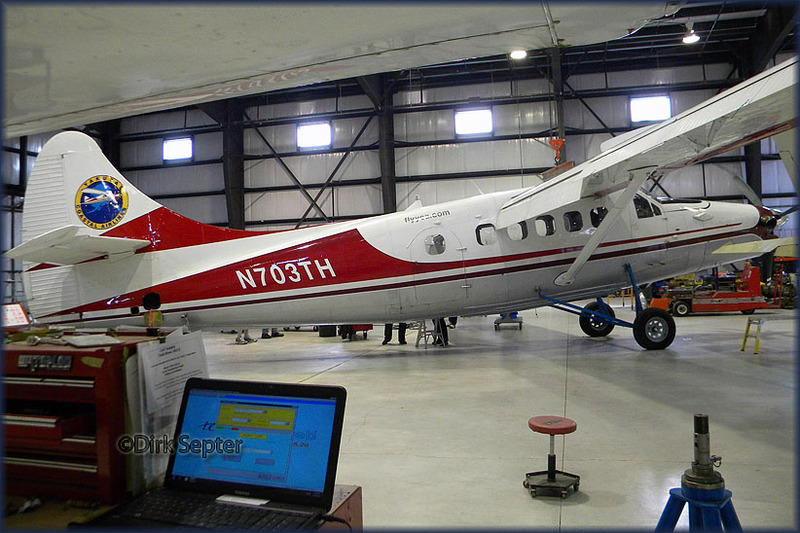 The company specializes in retrofitting firefighting aircraft as well as operating a fleet of the same. Starting in 1978, Conair began retrofitting Grumman S-2 Trackers, carrier-based submarine tracking aircraft purchased from the Canadian and U.S. navies, as Firecats. That's why they were nicknamed Trackers. They originated as Second World War aircraft, first built in the 1940s. Retardant tanks took the place of torpedo bays for a new life with the B.C. Forest Service. The adaptation lightened the aircraft, giving it greater flight capabilities in the close confines of B.C. 's mountainous terrain. Later re-engined as turboprops, 35 Firecats were built and they made their way to fleets as distant as that of the Sécurité Civile in France. They were based all over the province at one time and were a familiar site over the years in Kamloops. 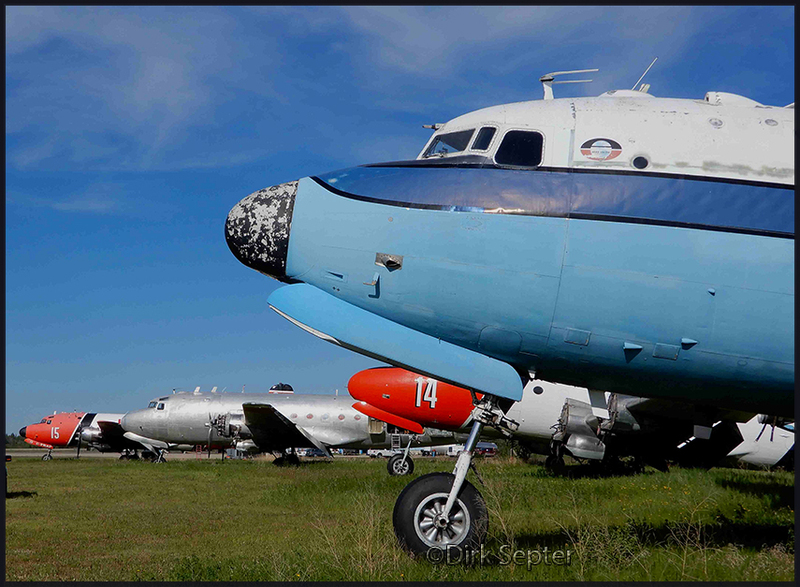 Like other air tankers, Firecats were a welcome sight to firefighters sweating it out in the heat of action. Their arrival on a fire can lift hearts because they often represent the best hope of meeting the "10 a.m. rule," once the standard objective of any initial attack crew battling a blaze. Berry wasn't sure whether Conair will offer the old birds for sale or lease them on contract. 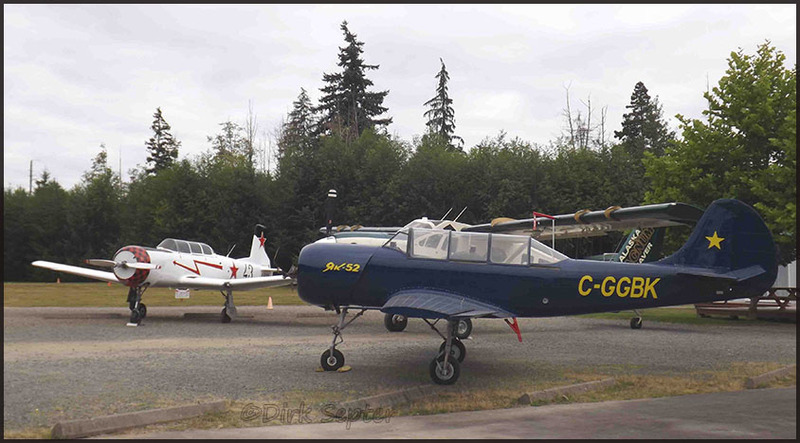 Convair CV-580s have replaced the Firecats in B.C. 's air-tanker fleet. "Finally something interesting at Campbell River! Also, interesting that serial 4193 is not mentioned in Air-Britain's "The Douglas DC-3 and its predecessors". The DC-3 is registered to 'Historic Flight Foundation'. " EXIF data on the images sent show date 05JUL2010. One can read the details on that serial and the story behind the nose, 'hump'-badge, a.o. on my page More Gooney Birds. I came across N877MG myself upon my visit to Campbell River on 14SEP2010. 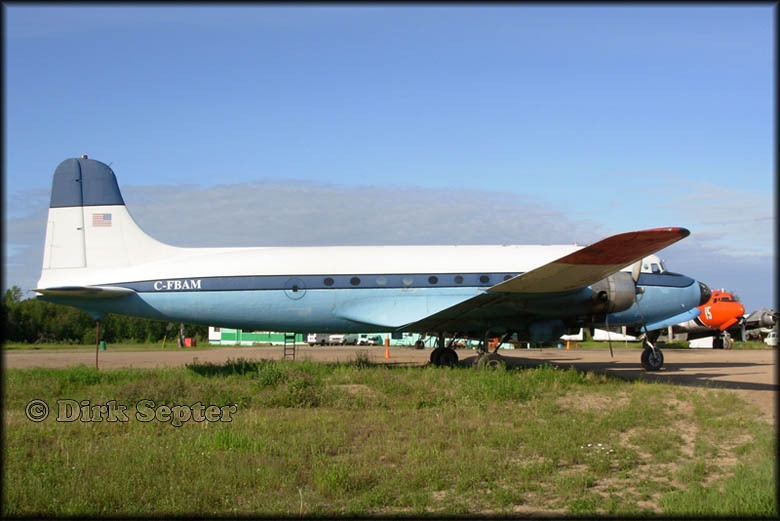 DC-3 N877MG was repainted during the summer 2012 in classic Pan AM colours; unfortunately it had to be redone as the first attempt used incorrect colour. Here's what Dirk sent 25Sep12: work seems to have been completed and the cabin looks splendid! 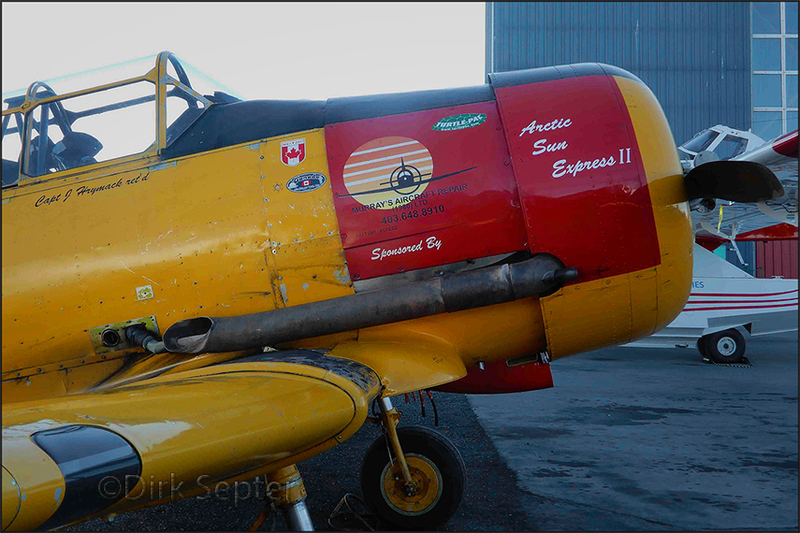 Dirk Septer wrote me and sent this photo 08Nov12: "N877MG just before leaving Campbell River, BC (CYBL ) for home at Historical Flight Foundation, after two and a half year rebuild at Sealand Aviation." 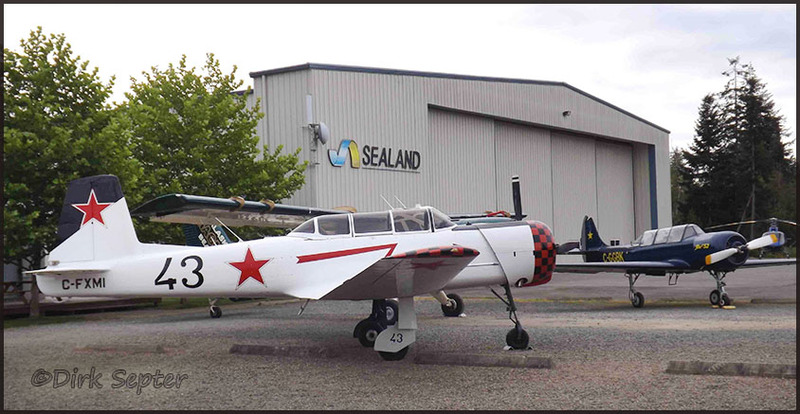 For more history on this historic transport see visit to Campbell River's Sealand Aviation in 2010. 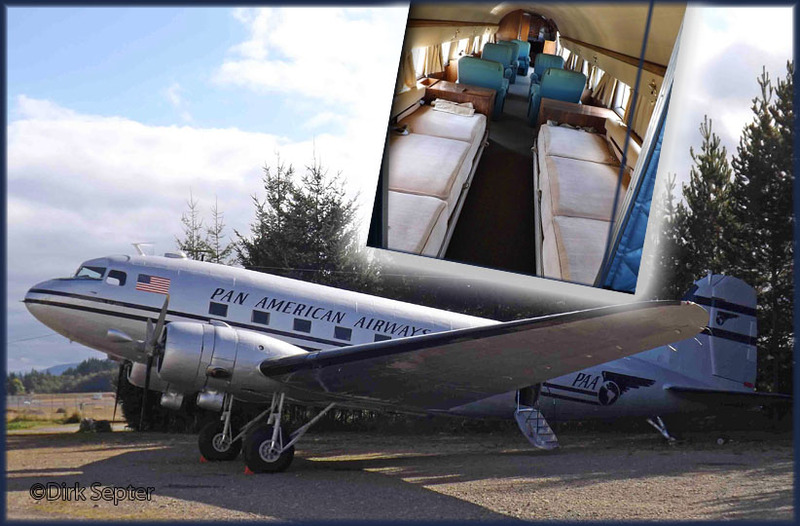 "I just wanted to let you know (if you didn't already) that she arrived at her new home last Wednesday at Historic Flight Foundation, Paine Field, Mukilteo, Washington. 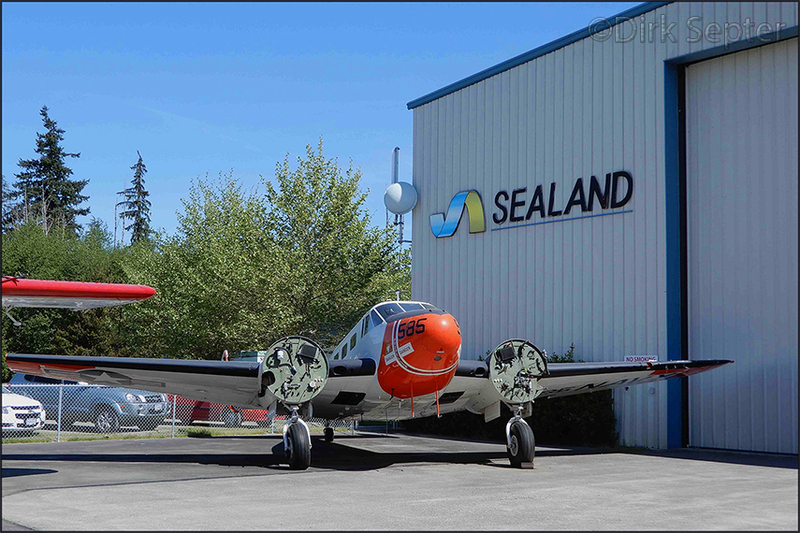 She looks brand new after an amazing restoration by the guys at Sealand Aviation in Campbell River, BC. John Sessions is already trying to figure out how we want to utilize her, and doesn't want to wait until spring to begin doing flights with her. I know the history is a long and illusive one, and I hope to learn more about it as I get to know the plane better." "When Convair terminated production of their successful CV-440 turboprop, Canadair acquired the rights to the design, jigs and tooling, as well as three unsold 440s. 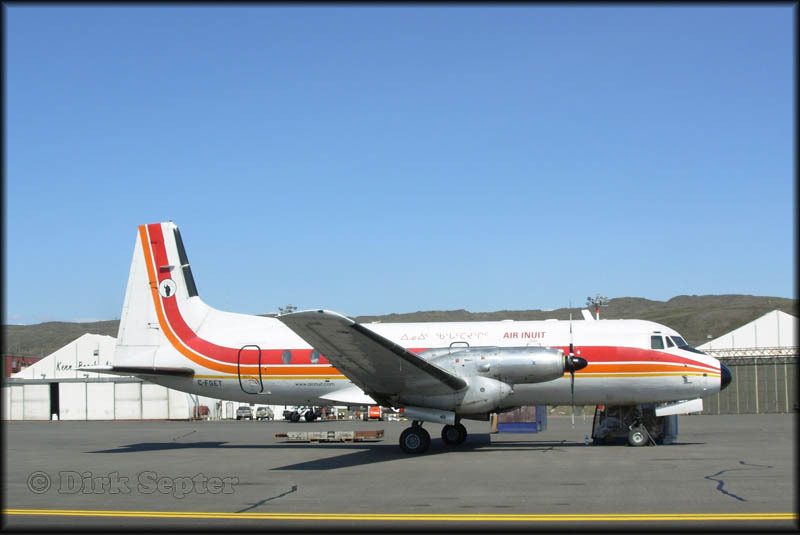 Based on the Convair 440 and powered by Napier Eland turboprops, Canadair built 13 aircraft designated as the CV-540. The Royal Canadian Air Force, which purchased 10 of these, would be the only customer and no further aircraft were built. The RCAF purchased the 'Cosmo', as the aircraft became known, to replace their ageing Douglas C-47 and North American B-25 for VIP transport and light transport duties. Entering service in 1960 as the CC-109, the last of these was retired in 1994. As the Napier engines proved to be unreliable and somewhat underpowered, the RCAF re-engined the aircraft with Allison 501s in 1966-67. In the early 1990s, the Cosmo was phased out to be replaced by the CC-142 Dash 8 and CC-144 Challenger." Early August 2009 Dirk wrote me: "As the heatwave continues, with temperatures in the 30s up to 40, the country is ablaze with forest fires... 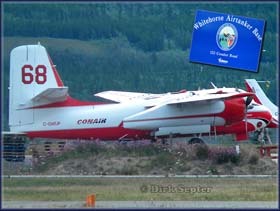 The two Convair waterbombers based here at Campbell River are constantly flying over my house, to drop their loads somewhere on fires on the mainland. 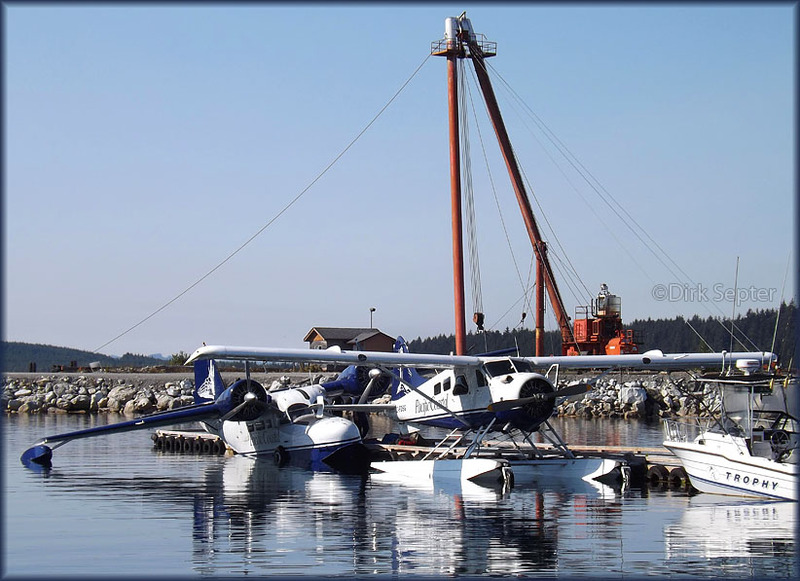 Also a photo of the long-time project Yak at Sealand in Campbell River." 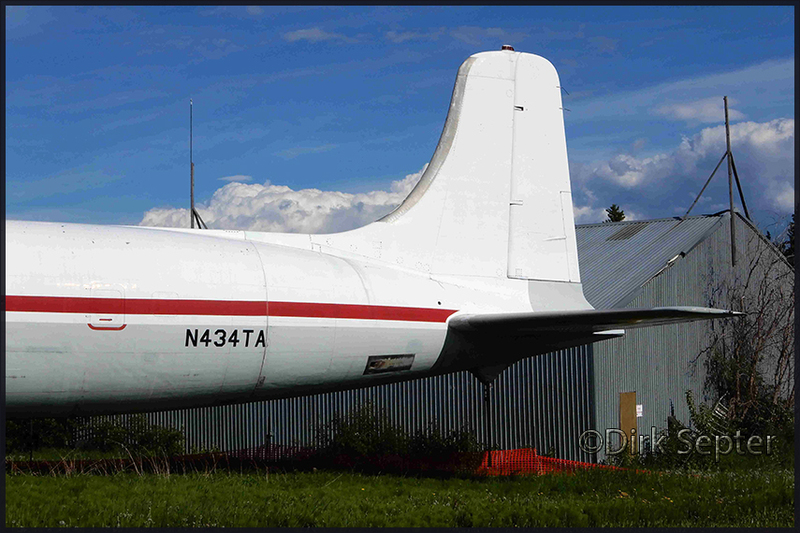 Convair CV580 C-FKFB (c/n 57), converted to Airtanker ('47') by Kelowna Flightcraft (?) and Conair. Dirk wrote: "Ran into Niels (remember that young Dutchman at Sealand? 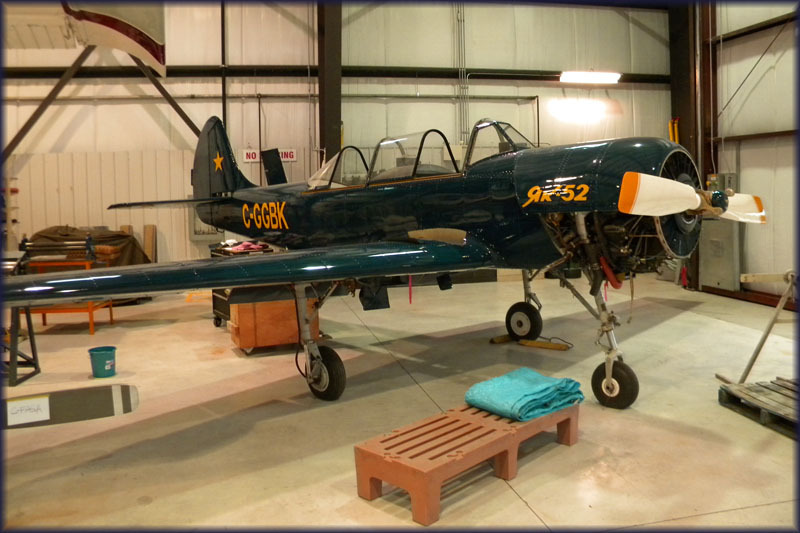 ), he was putting the finishing touches on that long-term Yak project, which they hope to take for a first test flight soon. Unfortunately Niels probably won't see it fly as he'll be returning to Holland within a few weeks from now, for good..!" Here are a few you might be interested in." 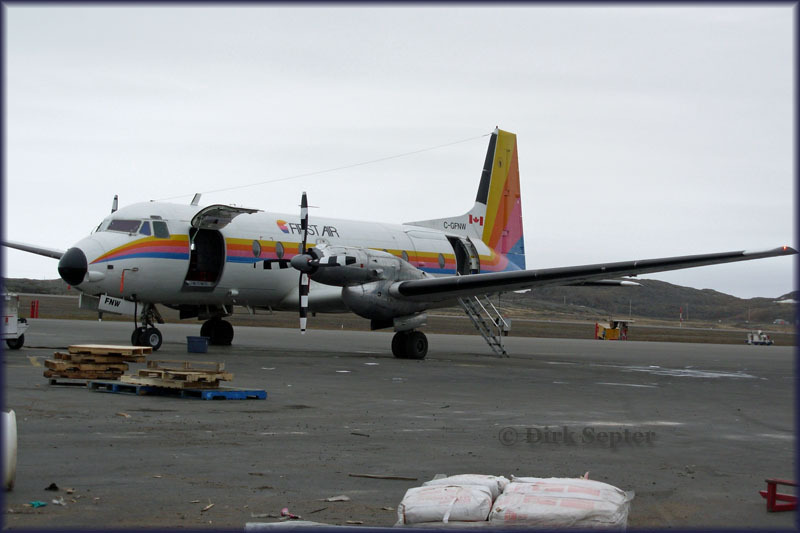 Avro 748-244 series 2 C-FGET (c/n 1724) of Air Inuit on 10Jul09 at Iqaluit. C-GCFR (s/n 102) was the first 150 series made. It was delivered in May, 1986 and holds 18,000 lb. of fuel (with two 4,000 lb. auxiliary tanks inboard of the #2 and #3 engine nacelles.) Fuel dumping is available for the auxiliary tanks to attain maximum landing mass in case of emergency. For normal operations only around 14,000 lb. of fuel are loaded. The aircraft can stay airborne for almost 16 hours with VFR reserves. Due to the extra equipment its operating mass of 31,000 lb. is slightly higher than the usual airline version. 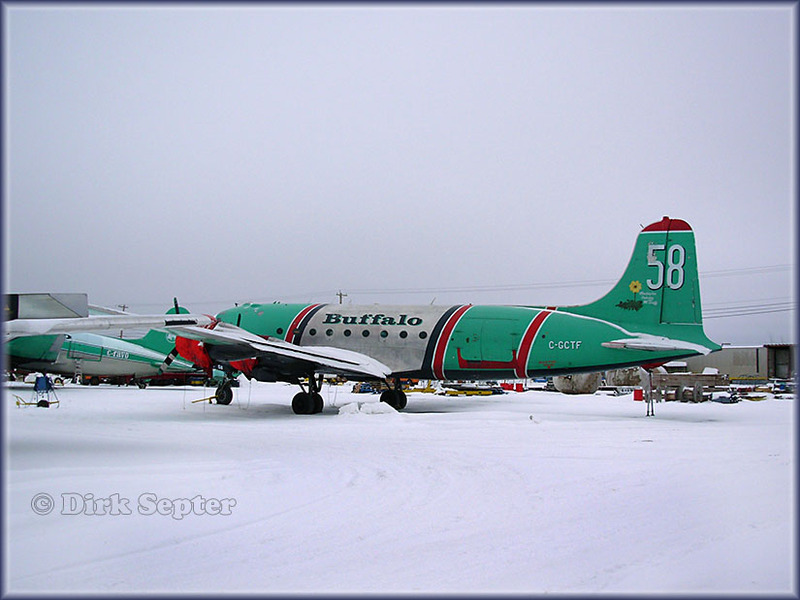 Hay River,NWT is a base for Buffalo Airways; aircraft are stored here for future (spares) use and no doubt maintenance can be done here too. Dirk visited Hay River during early July 2009 and sent these photos. 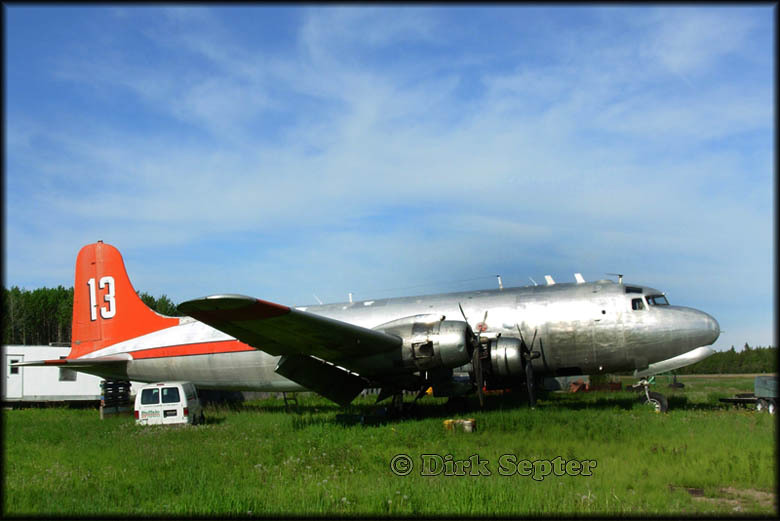 Tanker 56 is C-GBNV, a Douglas C-54G (c/n 35988/382). 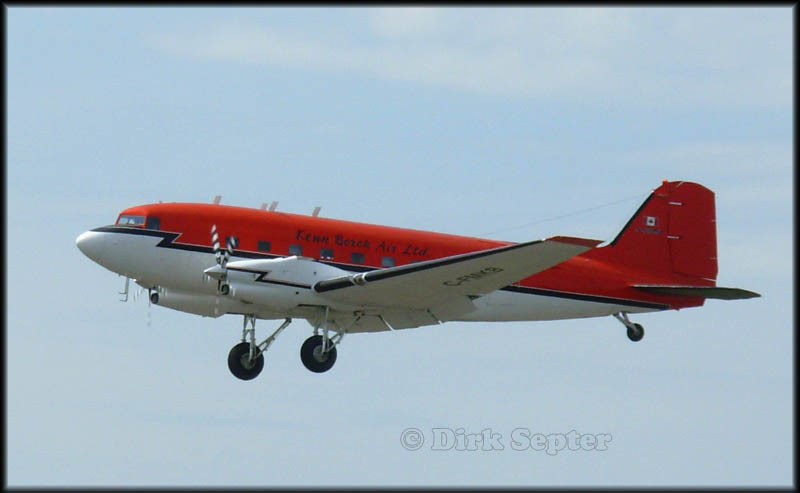 Tanker 14 is C-GBAJ, Douglas C-54E (c/n 27328,linenumber 274). I'd seen it at Red Deer in 2006. And so here it is at Hay River, taken out of service? 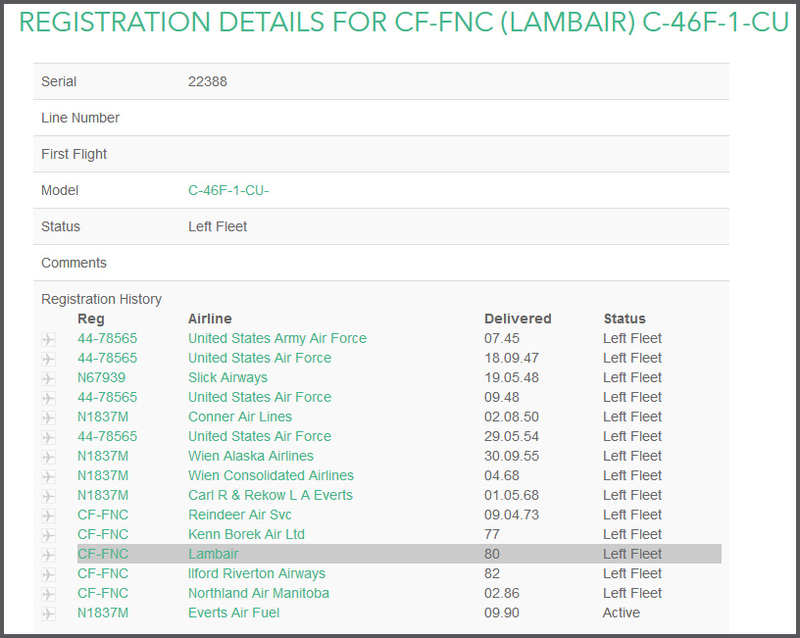 Tanker 13 is C-FBAK (c/n 10613), although that tailnumber is not on the aircraft to be found. Dirk added: "Strictly speaking, tanker 13, 14, 16 and 57 are not tankers, just maybe potential ones..."
Consolidated-Vultee PBY-5A C-FUAW (CV-302) was reported for sale in 2004. 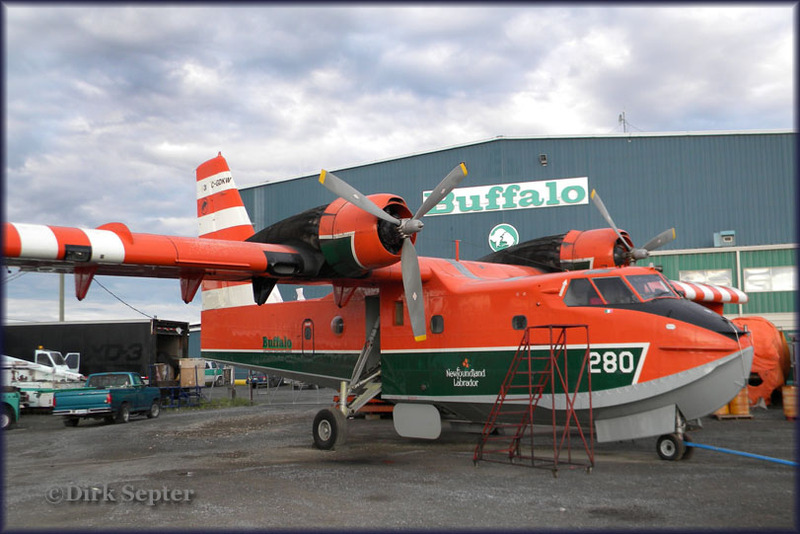 Buffalo Airways finally sold this last PBY Canso to Bob Dyck of Victoria, BC. On November 3rd, 2010, the aircraft (with 12,919.5 hours TT) left Hay River, NT via Prince George, BC to her new home base of Victoria. 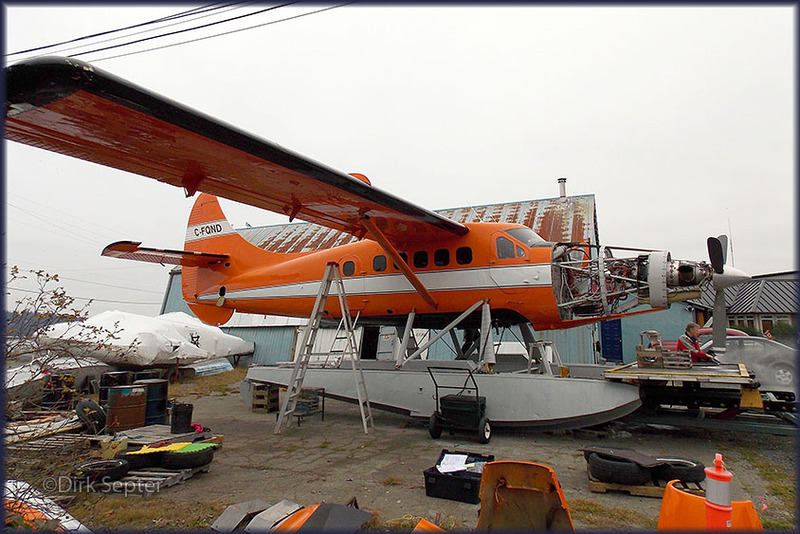 Dyck plans to operate the aircraft in full passenger configuration to give flying tours; the name to look out for: Pacific Flying Boats Ltd. 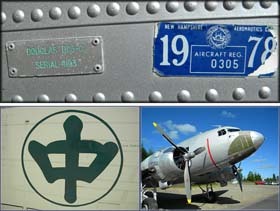 The Canadian authorities record the manufacturer’s serial number (or constructor’s number) as CV-201 (CV being Canadian Vickers). However, the actual identity is CV-302! "I (signed his name as 'der1'.. -Webmaster) am the secretary of the newly formed 'The Catalina Preservation Society' 2011 in Victoria British Columbia, Canada. Formed as the support group for Pacific Flying Boats Ltd. (found no trail of a website on either of these names -Webmaster). PBY Catalina C-FUAW is completely airworthy and any little ailments are well tended to by Bob Dyck and volunteers. We have begun the groundwork to acquire C-FUAW ensuring its home for the foreseeable future. My history with the PBY began about 1978-9 with the Flying Fireman. There I flew PBY's fire fighting until 1986 from British Columbia and Alberta to Manitoba and Ontario with short forays into Michigan." In a preservation project dubbed “the Cat came back”, a group of Victoria, B.C. aircraft buffs are restoring a Second World War plane, a PBY Catalina. 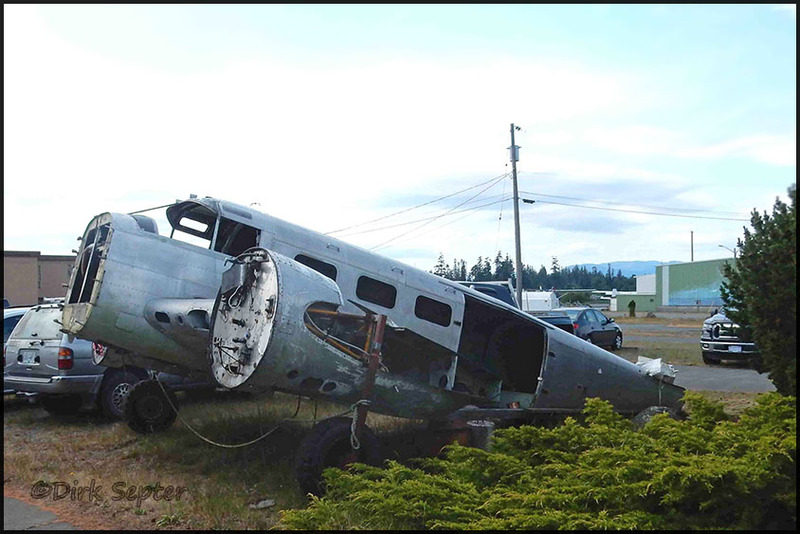 It’s a project to restore a plane that flew real patrol duties during the Second World War from the RCAF station at Pat Bay. Back then, the plane was known as RCAF 11024 and its first home was in No. 3 Operational Training Unit RCAF Station Pat Bay. It would also serve a long and distinguished career all across Canada in military and civilian roles. “It will be one of the few warbirds in the world that actually represents itself,” said Pat Phillips, president of the Catalina Preservation Society. 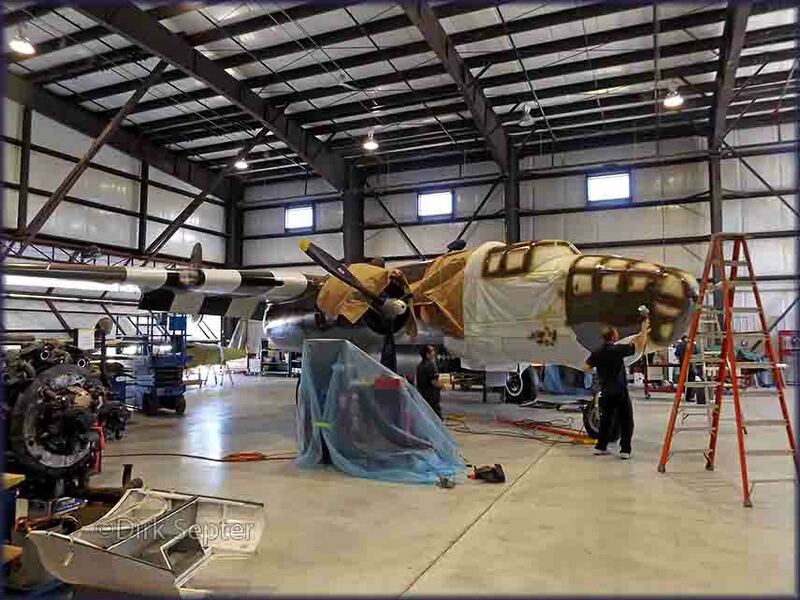 People involved in the plane’s restoration include 93-year-old Russell Redman of Victoria, who flew anti-submarine patrols in RCAF 11024 during the Second World War. Another, Dave Scott, 65, of Langley agreed to donate original markings for 11024 produced at his company, Nurndy Graphics. Scott said he was delighted to help because his father, Edward Henry Scott, who died in 2005, was a wartime Catalina pilot. His logbook reveals he flew 11024 on several missions from Pat Bay. The aircraft type, the PBY Catalina, is a flying boat, designed to take off and touch down on water. About 4,000 were built, 620 in Canada, and it would become one of most widely used, reliable, and storied aircraft of the war. One story occurred on May 26, 1941, two days after the German ship Bismarck sank the British battleship HMS Hood. It was men flying a PBY from Scotland who spotted the Hood’s killer in the Atlantic. The next day, Royal Navy ships engaged Bismarck and sank it. Over in the Pacific theatre, on June 4, 1942, it was pilots and observers in a PBY who spotted a Japanese carrier strike force about 220 nautical miles northwest of Midway Atoll. Alerted, American air and naval forces achieved a decisive victory. Throughout the war, the Catalina had many names. Designed and built in the U.S., it was first called PBY, for Patrol Bomber, by the abbreviation-loving Americans. The Y was the U.S. Navy’s symbol for manufacturer Consolidated Aircraft. Sold to the British, it was called the Catalina by the Royal Air Force, after the small island off San Diego where RAF officials first viewed the plane. Later, when downed American airmen were rescued from the sea, they called the flying boat a “Cat”. When it was patrolling and bombing, it was a PBY. 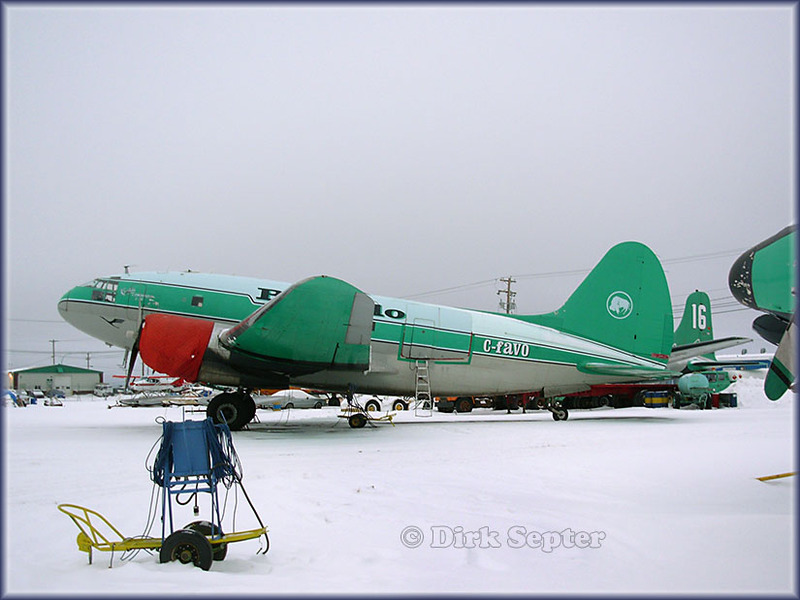 A version built under licence in Canada became known as Canso. Now many say “Canso” refers to the 800-odd amphibious versions, built with wheeled landing gear that allowed them to touch down on land and water. RCAF 11024 was a wheeled version built in the Cartierville, Québec Vickers factory. It arrived on Vancouver Island in July 1943. At the war’s end, the plane left Pat Bay and became one of the first aircraft to form the new Search and Rescue Group for the RCAF. The plane flew in that role from Newfoundland to Vancouver. 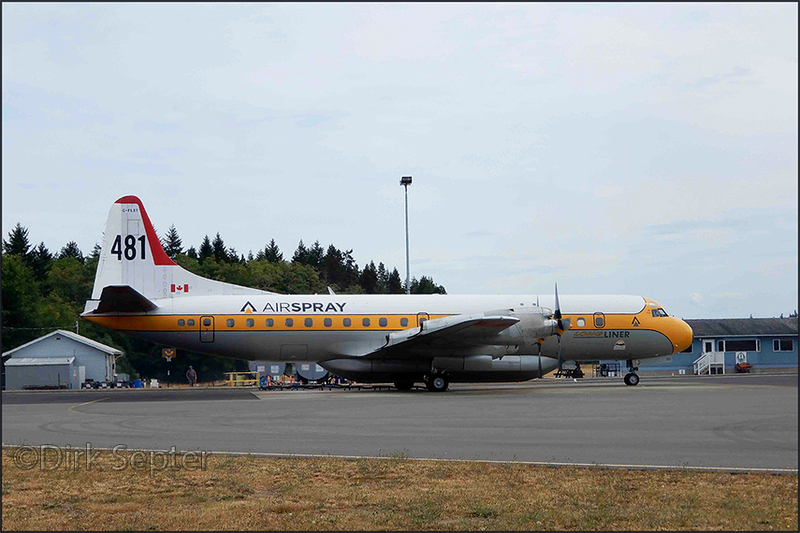 In 1961, RCAF 11024 was retired and sold into civilian hands to a company called Airspray. The plane lost its military numbers and became C-FUAW. 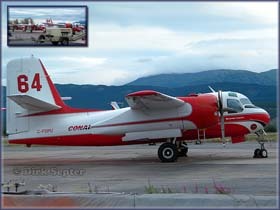 In 1966, C-FUAW was bought by a company called Kenting, which converted it to a freighter/water bomber. The blister-style canopies on the rear fuselage used by observer/machine gunners and the one in the nose were removed. The plane was later sold to Norcan Air, which flew it over northern Saskatchewan. 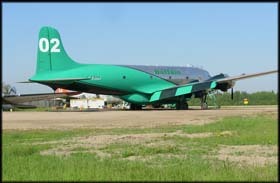 It was then sold to the Saskatchewan government to be used as one of a small fleet of water bombers to fight forest fires. 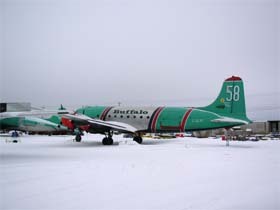 In the early 1990s, C-FUAW was sold to Buffalo Airways. The plane was painted yellow and red and used over the Northwest Territories before it was parked in Hay River, N.W.T. It sat there until 2010, when it was found by Bob Dyck of North Saanich. A commercial pilot with hundreds of hours on Catalina water bombers and flying freight over Africa, Dyck has a real fondness for the aircraft, which he still calls “the unsung hero” of the Second World War. 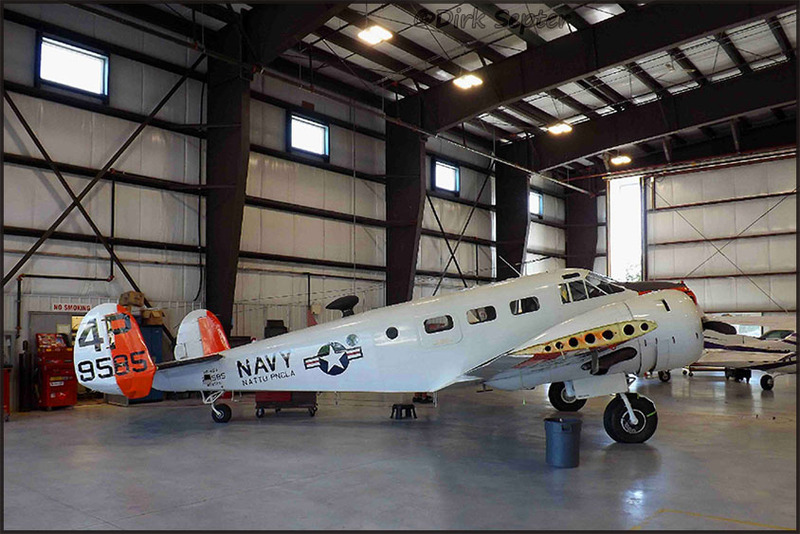 Dyck had become horrified at the number of Canadian heritage aircraft leaving the country for museums and collections overseas, so he was hoping to find a Catalina for preservation. “I just decided to step up to the plate and do something,” he said. In anticipation, before he located a suitable Catalina, he had purchased the Plexiglas blister canopies and the Plexiglas for the nose turret. 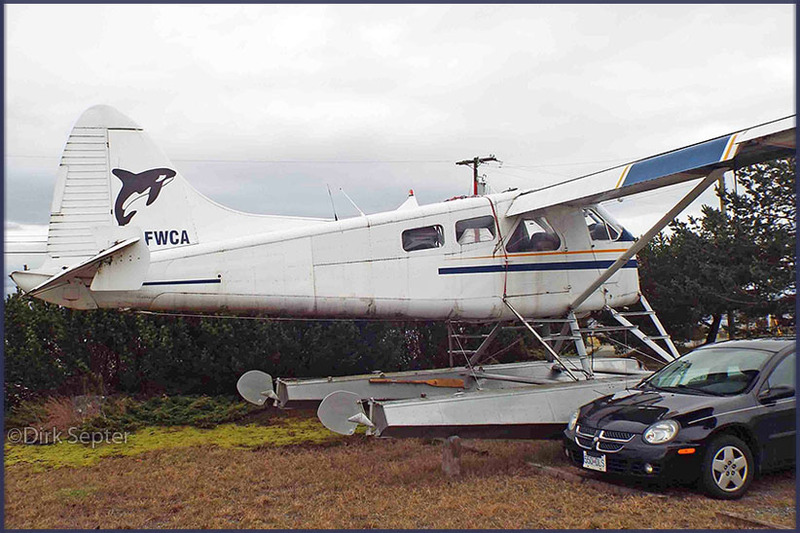 In 2010, Dyck heard of a Catalina sitting in Hay River. 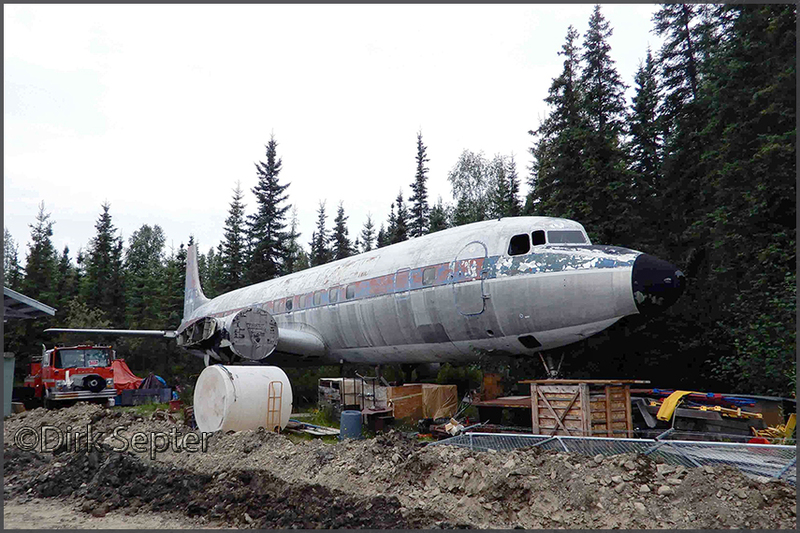 After checking out its history, Dyck said he realized he had found his plane. 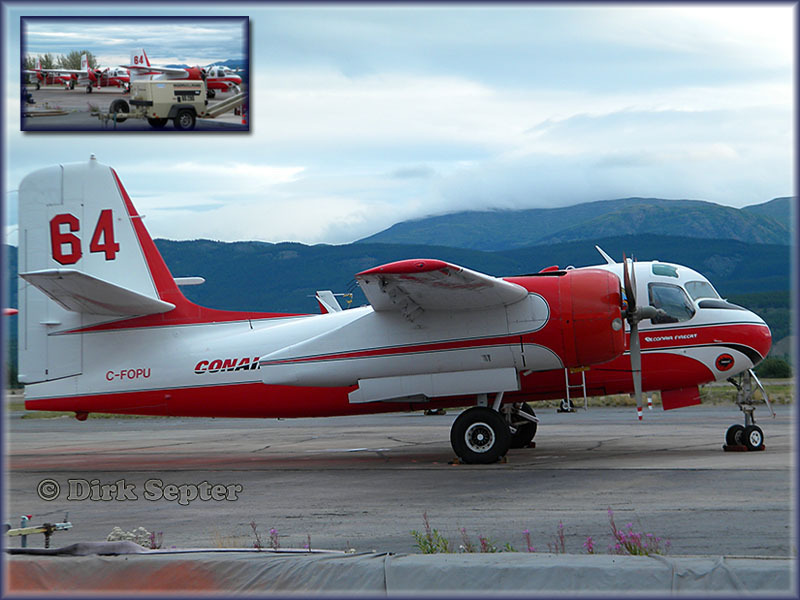 "C-FBAP Tanker 15; during the 2009 forest fire season this one, and C-FBAJ, were active and ready to go. 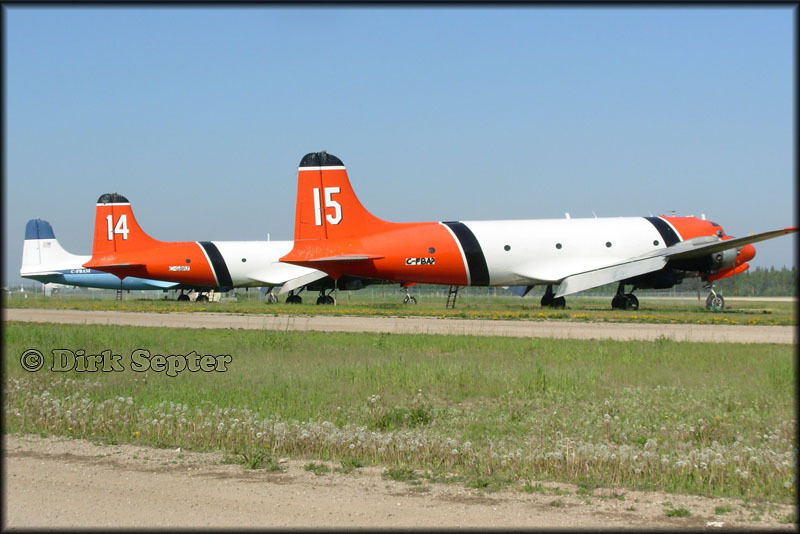 C-GCTF Tanker 58 was also based at Hay River, acting as a spare plane." 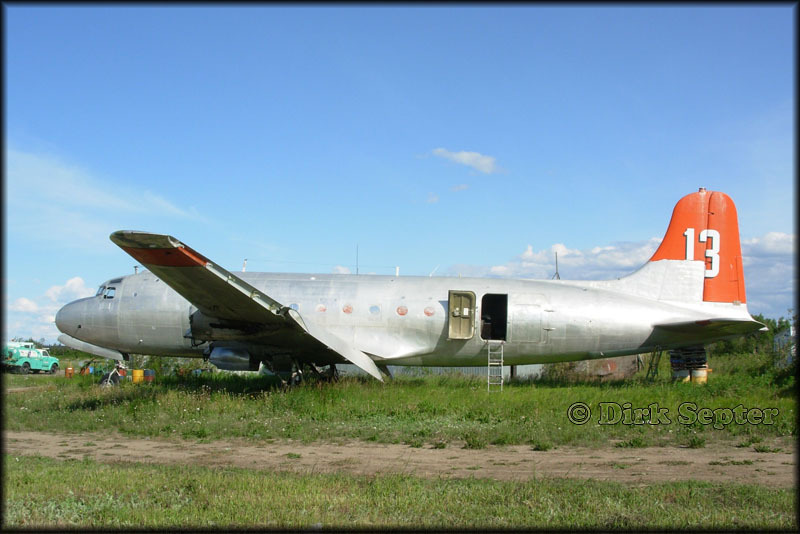 Douglas DC-3 C-GEAJ (c/n 14675/26120) has been converted by Basler to turbo power and has now type designation 'BT-67'. It has a badge on the tailfin: ALCI, which is short for Antarctic Logistics Centre International. C-GEAJ crashed in Antarctica 05Jan09, and it was feared to have been written off. But a team of Kenn Borek Air made repairs on the spot and it was flown back to Canada! 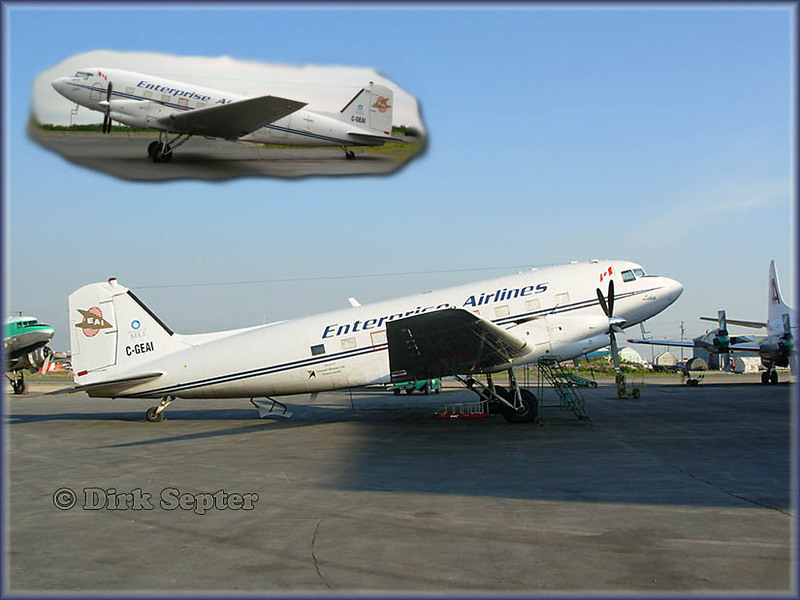 Enterprise Airlines / ALCI seems to have ceased operations. C-GEAJ was registered to Kenn Borek Air on 01Oct2009. 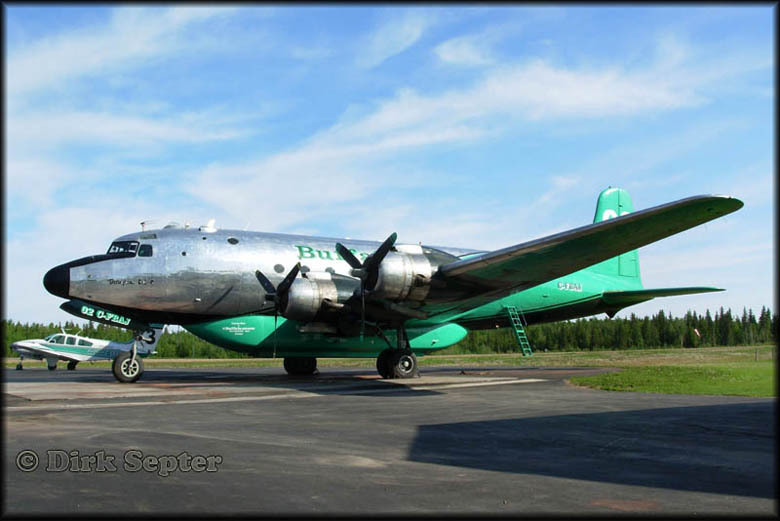 Buffalo Airways at Hay River; these were taken in 2008. C-54G C-FIQM (c/n 36088/482), tanker 57. Registered to Buffalo Airways 03Jul07. 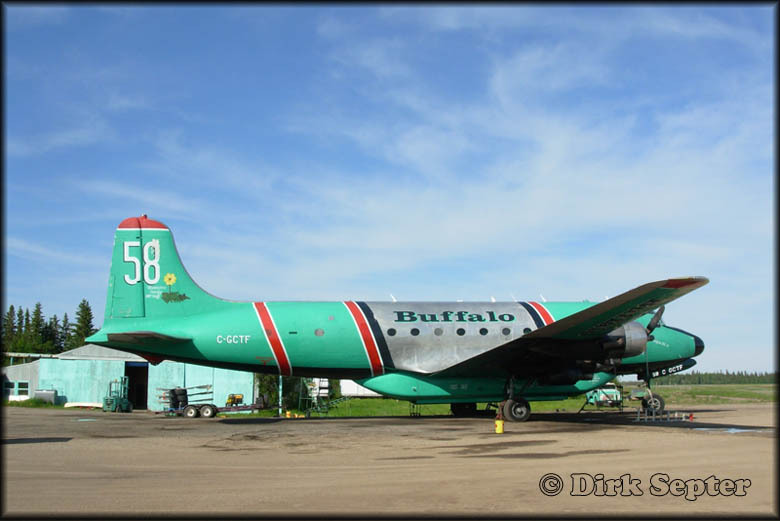 C-54G C-FBAM (c/n 36009) was sold by Aero Union in 2005 to Buffalo Airways, having had them for 19 years. Aero Union had trouble in licensing the aircraft for use of an aerial firefighter since it was US registered (N4958M) in an experimental category. C-GEAI, the BT67 sister ship of C-GEAJ. Dirk took these photos on 25Jun07 and 29Jun07 Yellowknife airport. 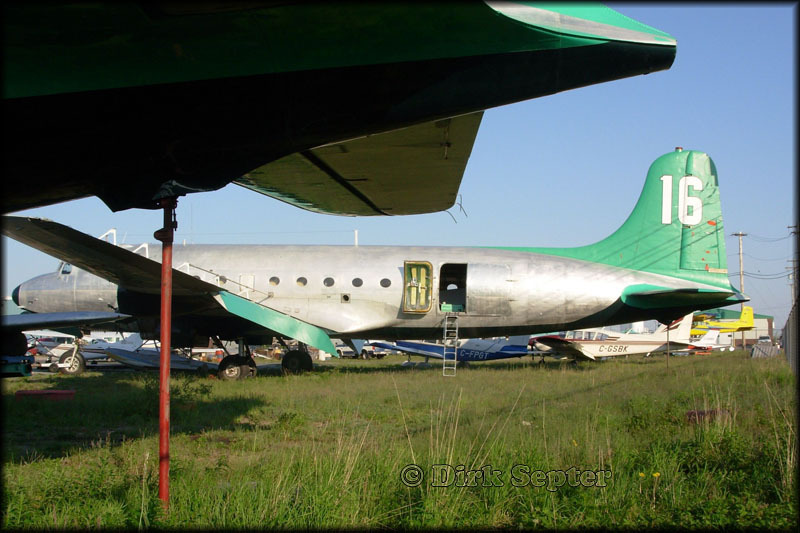 'Enterprise Airlines' failed in later years and C-GEAI (c/n 33053) was registered on 28Sep09 to Kenn Borek Air of Calgary. 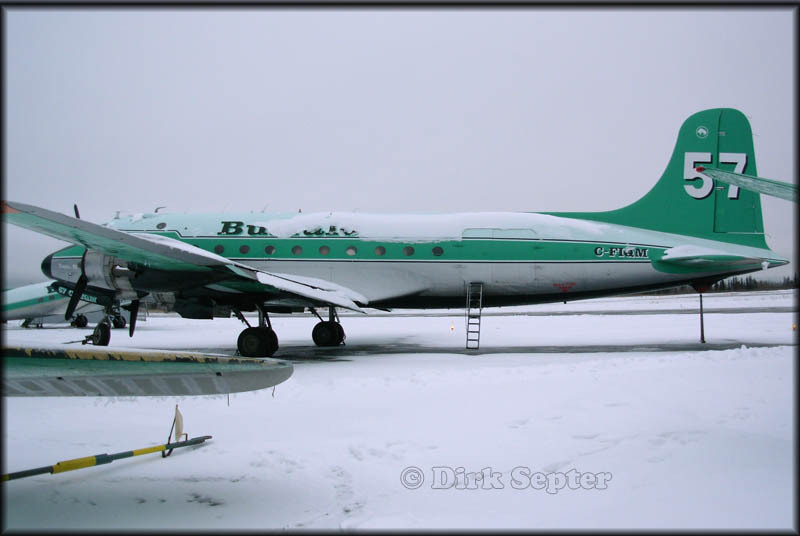 Its previous tailnumber was N200AN, as seen by Frans Truyens in Alaska 2001 HERE..
On 20Dec2012 it was damaged at Antarctica when it hit a snowdrift whilst taking off. A salvaging job during end-2013 was completed in jan.2014. Photos PHOTOS BY FRIENDS & GUESTS (39). Note changed livery & titles. Kenn Borek's sister ship C-FMKB taken at Yellowknife,NWT on 30Jun07. 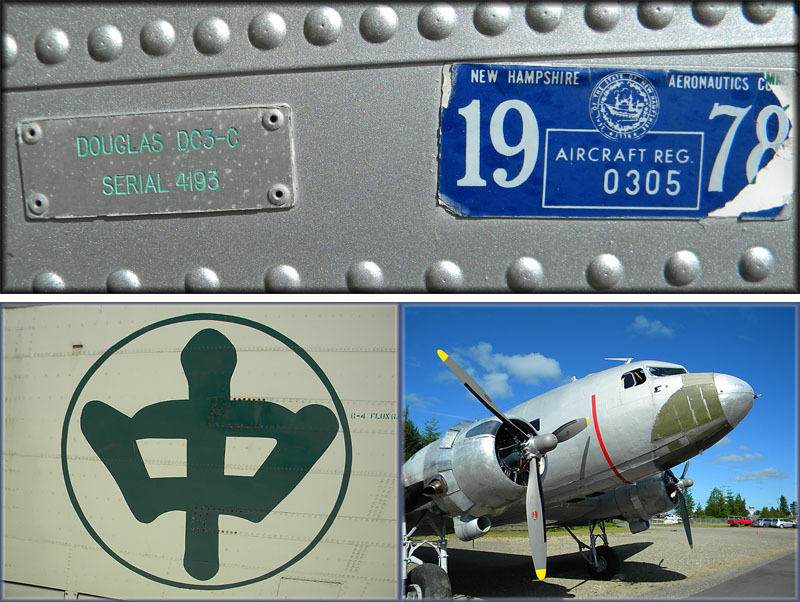 Cconversion was performed by Basler Turbo Conversions, in Oshkosh (WI), of Douglas C-47A c/n 19560. 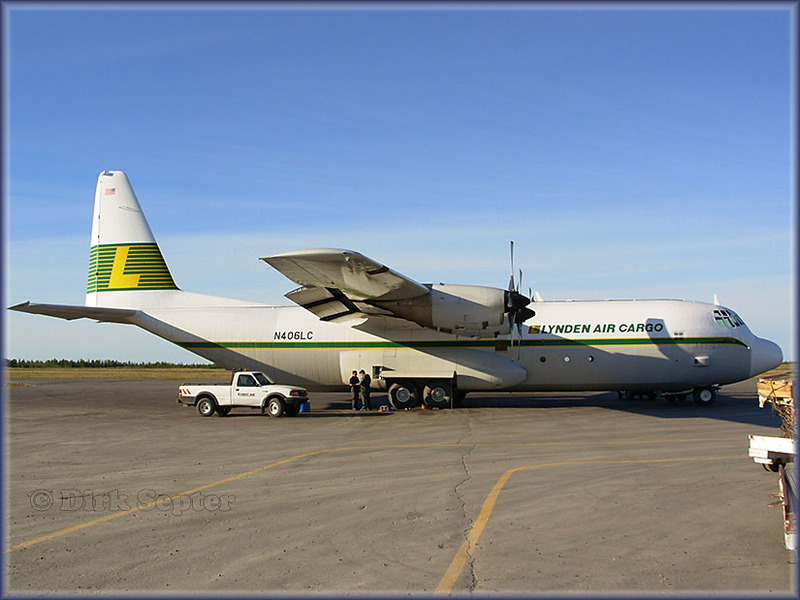 Here are a couple of shots of two chartered foreign C-130s replacing First Air Hercs, taken at Yellowknife, 22Aug06. Lynden Air Cargo has a cargo operation in Papua New Guinea and operates in the region as Lynden Air Cargo PNG. N406LC operated as such (reg'd P2-LAC) but the registration was cancelled as such and not reactivated in the FAA's Registry as N406LC. In early 2017 no new sightings of c/n 4676 had been reported (afaik). Perhaps damaged beyond repair on a jungle strip in PNG?. -->EMAIL. 15Dec2010: DHC-3 C-GHAG after a recent mishap (details?). This is at Campbell River, B.C. According to Langford, it all happened in about two seconds. It looks like GHAG will need a new wing and some fuselage repairs, luckily no one was hurt. 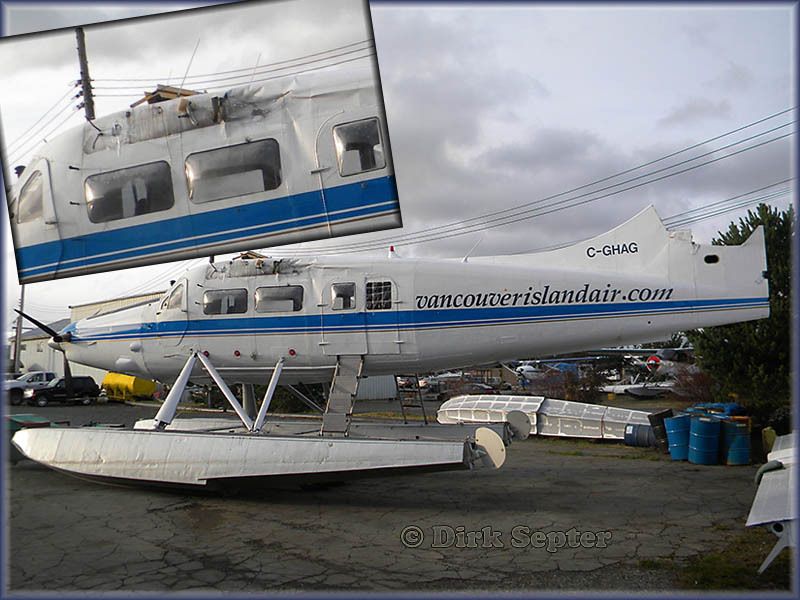 As of 15Dec2010, the Turbo Otter is still sitting at the Spit; as it was being leased from its owner Harbour Air, it will probably be shipped to Vancouver for repairs." In july 2011 Dirk sent me this photo-proof of C-GHAG fully restored, not a wrinkle in sight! (15Jul2011, Victoria's Inner Harbour). 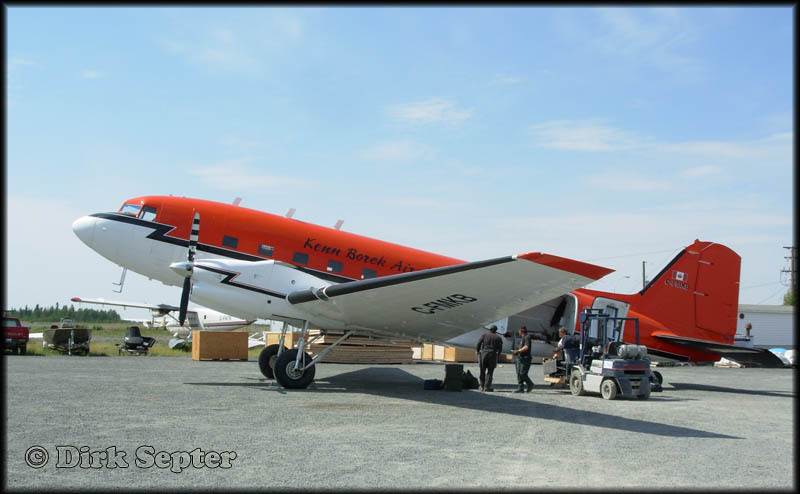 'Kenn Borek's new Basler DC-3 C-GVKB c/n 12300, taken at Iqaluit, Nunavut on 11Jul2011 where it is based. 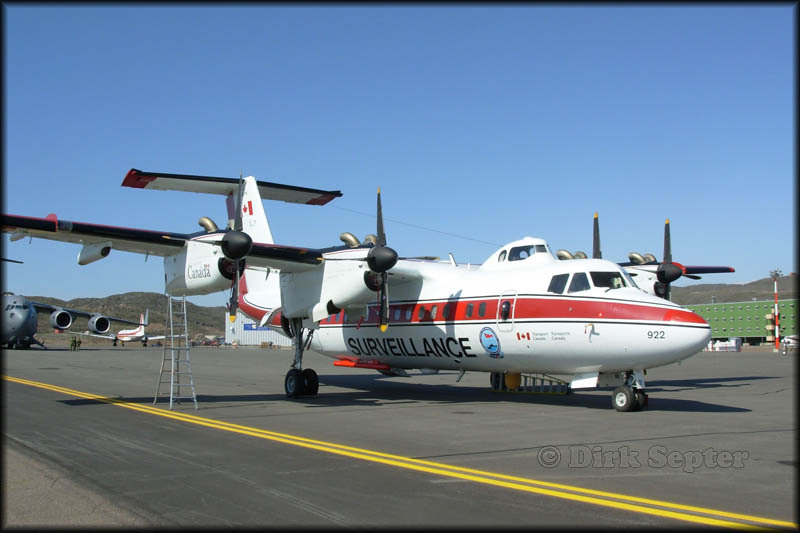 Bufallo Airways has acquired two new (used) Canadair CL-215 waterbombers, formerly operated by the Newfoundland and Labrador provincial government. The machines, both manufactured in 1987, are still in that province's striking colours. Tail number 280 (below) still shows their logo as well. C-GDKW (c/n 1095) tail number 280 and C-FAYN (c/n 1105) tail number 282. They were registered to Buffalo 03Aug10 and 08Sep10 resp.). C-FBAQ (c/n 1039) has a small forward cargo door. C-GLBA (c/n 1145) showing the large cargo door and custom-built ramp. 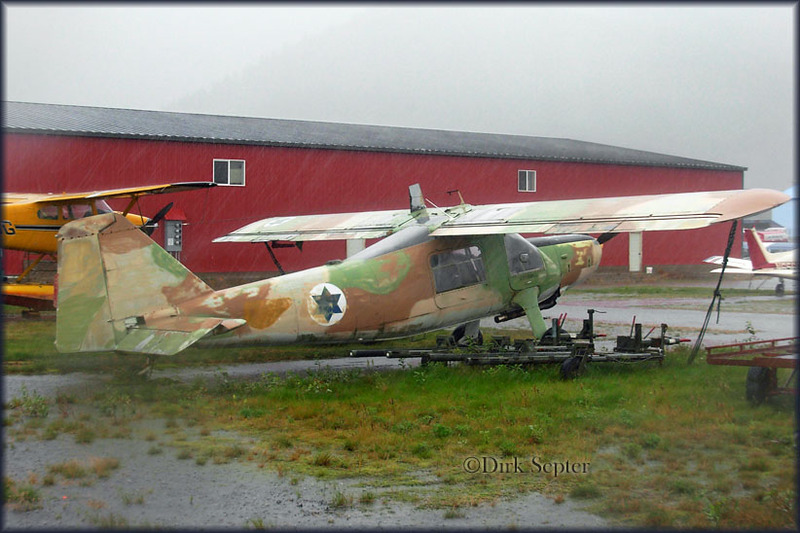 This is a photo of a Dornier Do-27B-1 in Israeli Air Force colours that I recently (Sep. 2011?) 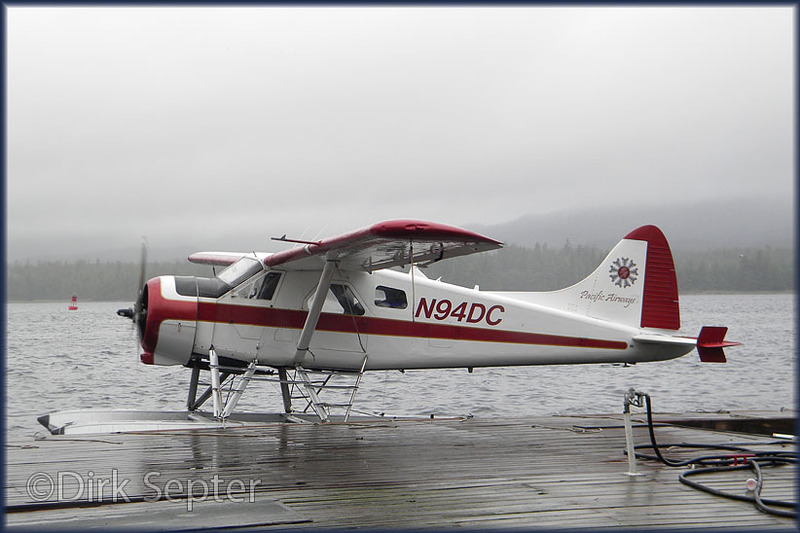 took at the Juneau Int'l Airport, inspite of the driving rain! "c/n 362 delivered to West German Air Force as PQ * 103; sold to Israel Air Force as Serial 021; disposed August 1983; sold to US; December 1983 registered N776AX to Aero International Inc. 26 September 1986 to Gregory L. Blanchfield as N776AX Still sitting at Juneau, Alaska, airport." 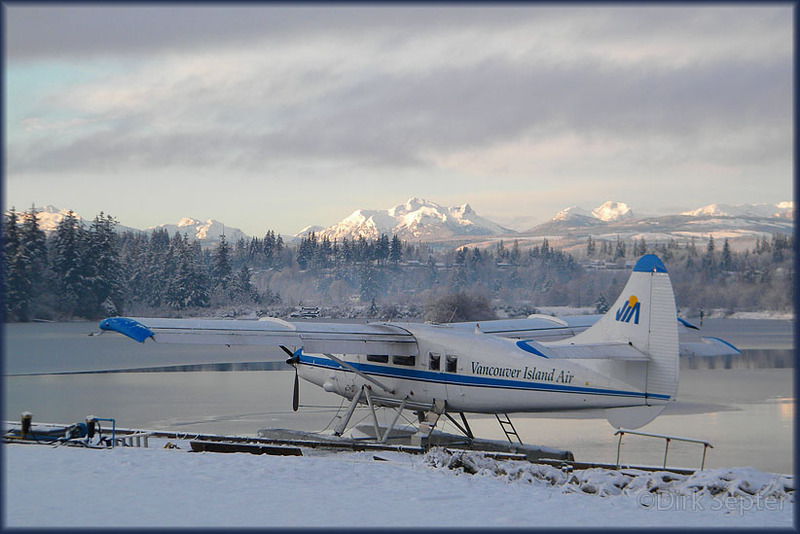 Dirk sent me these two images, taken on 29Feb2012 at the Spit in Campbell River on a nice crispy morning. I love the light! DeHavilland DHC-2 Beaver C-FIGF c/n 834. C-FIGF is special to me ever since Dirk arranged a trip for me in it! See my 2010 report. DHC-2 C-GACK c/n 711. Operated by Corilair Charters Limited. Dirk wrote: "Otters N703TH and N362TT at Sealand today, 14Apr12. Bill Alder had flown there earlier and installed additional fuel bladders for the long flight legs. The journey took 30 hours with three stops, with pilot Dave Crerar of Vernon and co-pilot Neil Mueller of Dease Lake. Due in Dease Lake on May 15th, then to be registered on the Canadian register. Bill Alder noted: 'if it won't be there at that date the new owner will shoot me!' 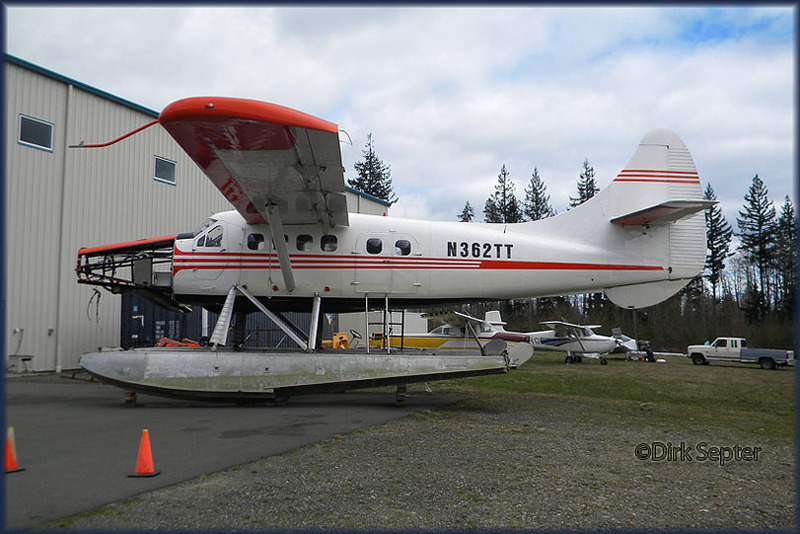 "
N362TT c/n 362- R&J Aircraft Leasing Corp / Renew Air Taxi, Anchorage,AK (Renew based @Dillingham). R05Jul00; mfr 1959. Ln 13Jun2010 ANC-Lake Hood strip with Rust's Flying Service t/t. N703TH c/n 456- CF-UKN Northway Aviation, reg canx17Aug09 as exp to USA. R02Sep09 N703TH Sky Pro Enterprises, Las Vegas,NV. R24May10 Hans W. Munich, Yakutat,AK. 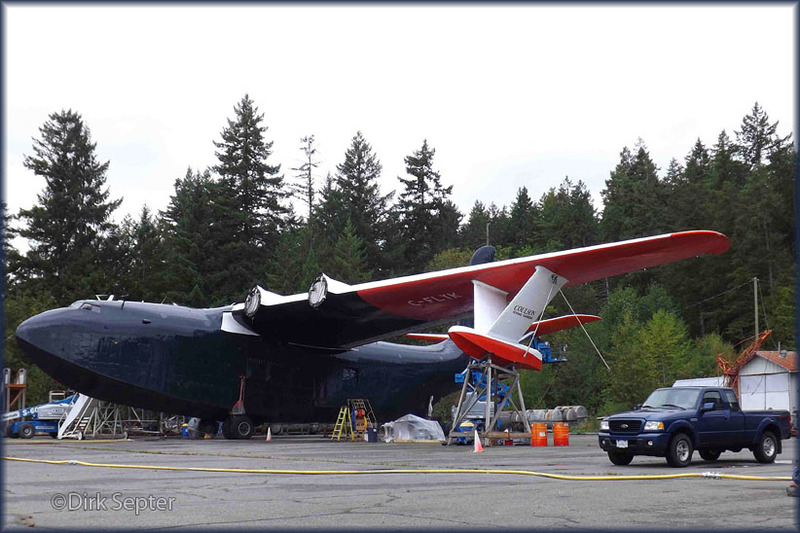 Martin Mars C-FLYK 'Philippine' is seen being painted at Sproat Lake on 29Aug12. The Coulson Group announced on 23Aug2012 that C-FLYK will be retired due to its lack of use for five years. Coulson is hoping to get a C-130 Hercules, or parts of a C-130 in exchange to add to the C-130 they already own, which is based in California. 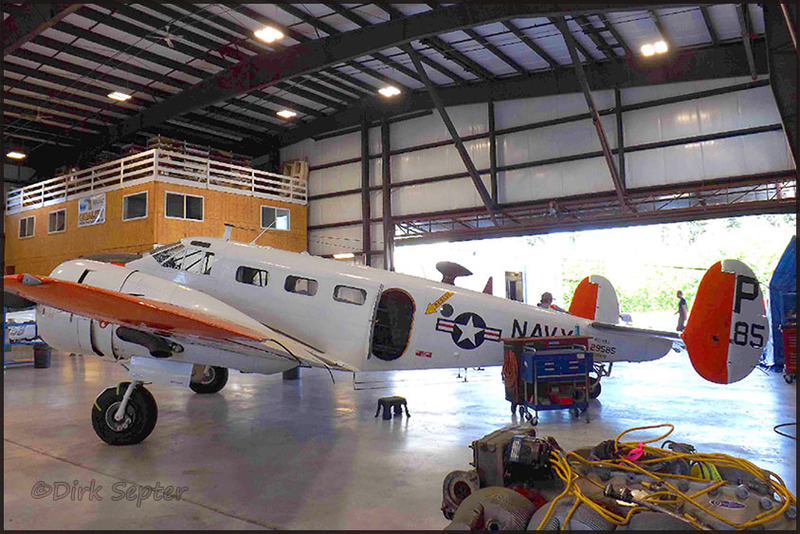 The photo shows the unique firebomber while it is being prepared for her last flight to go on static display at the National Naval Aviation Musuem at Pensacola, Florida. Wondering how many gallons of paint will be needed to cover the old girl ! 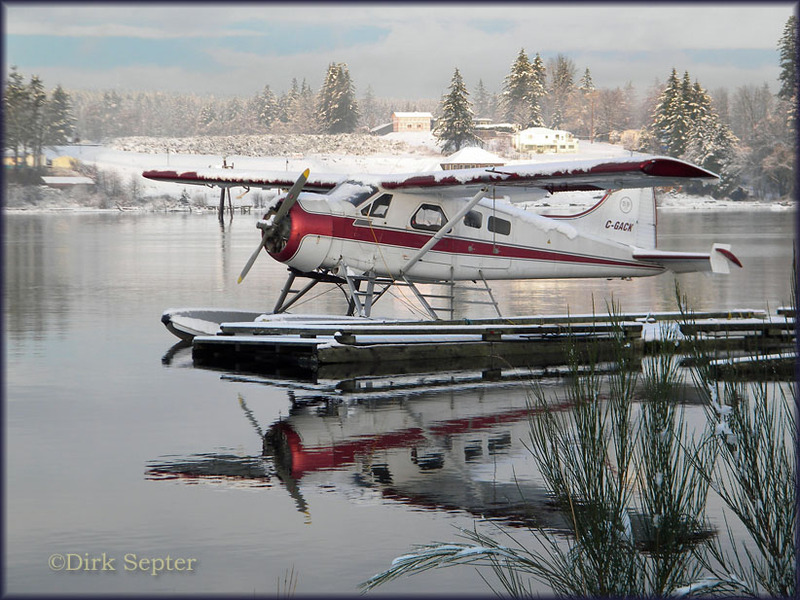 Dirk Septer sent me this DHC-3 Turbo Otter in a nice 'Vancouver Island Winterwonderland'.. 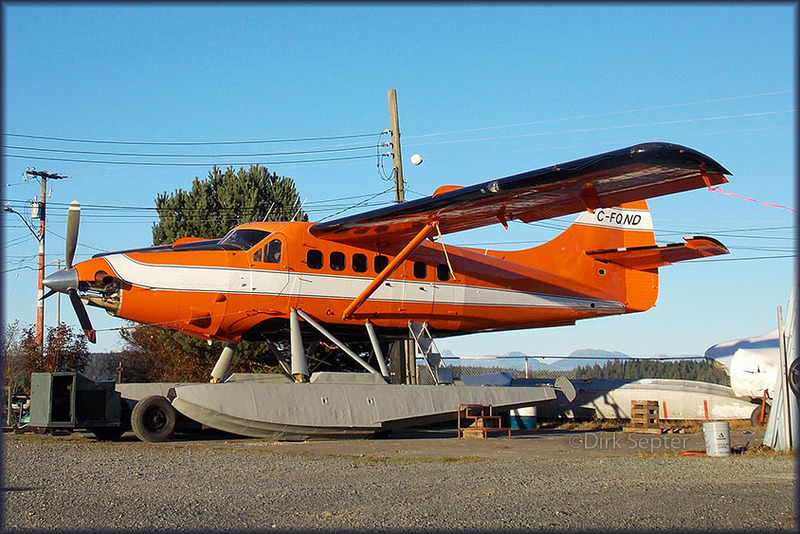 This is DHC-3T C-GVIX (c/n 97) which replaced GHAF at Vancouver Island Air. deHavilland DHC-3 C-GHAG (c/n 214) sailing in with some nice new colours on its tail. 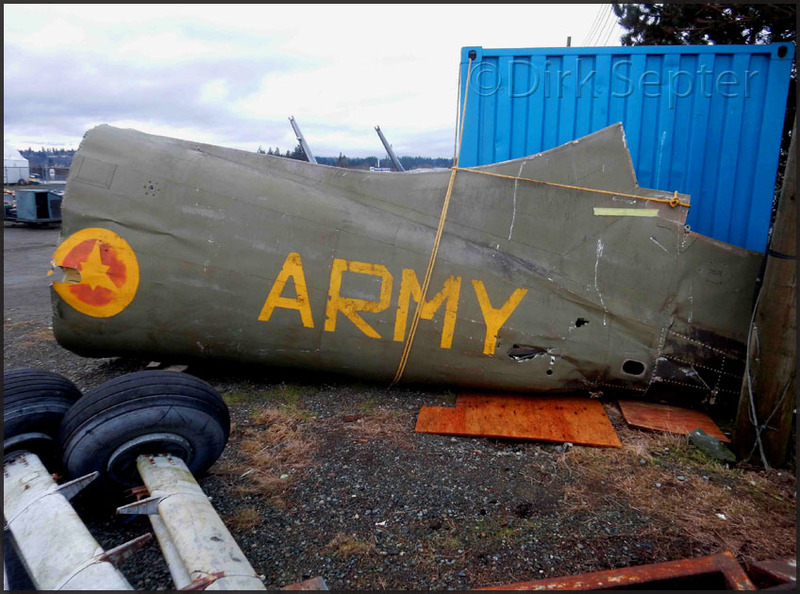 These eagles are quite accustomed to Beavers rumbling past..
A 'work-in-progress' photo of WW2 B-25 bomber 'Grumpy', getting a new paintjob at Campbell River,BC. Dirk wrote me (May 22nd): "Grumpy is scheduled to fly home on Sunday, May 24th. Sealand Aviation spray artist is seen doing the finishing touches." 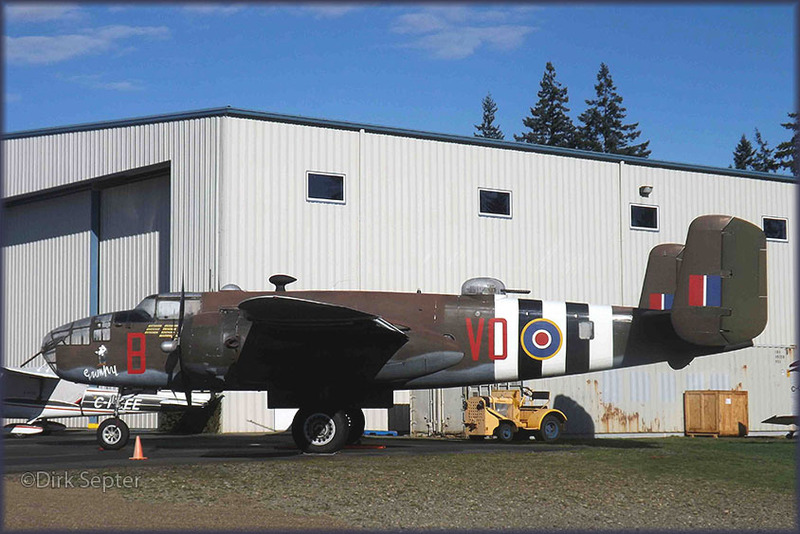 This B-25 Mitchell bomber belongs to the Historic Flight Foundation based at Paine Field,WA. See my 2014 visit. 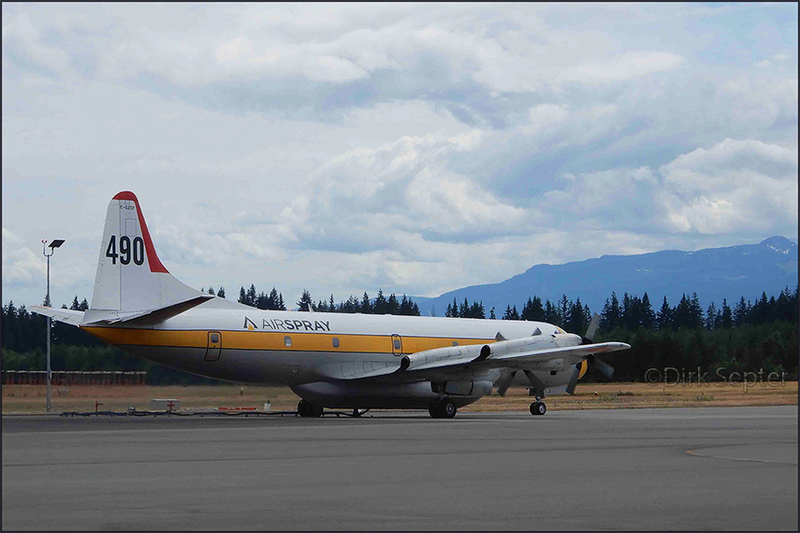 Dirk sent this one: "Harbour Air's 309 C-FHAA (c/n 357) with her new Royal Roads University paint scheme. The Exif data of the image showed date 10May2015. 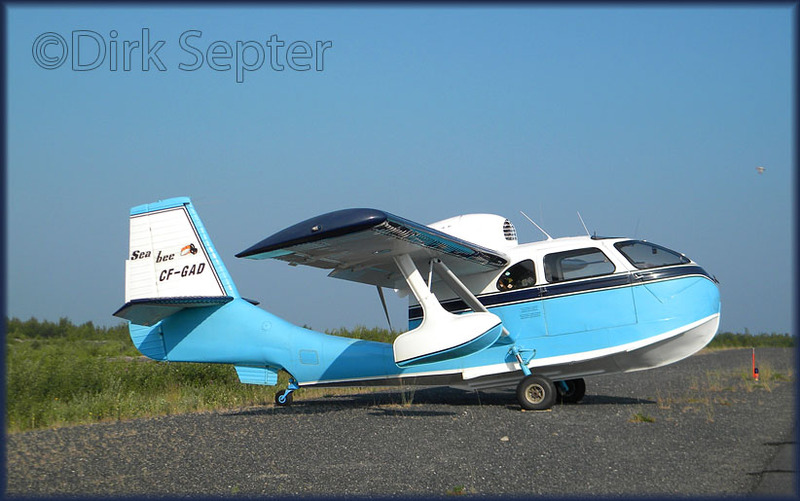 Over the years Dirk Septer has written many articles for a variety of aviation publications.